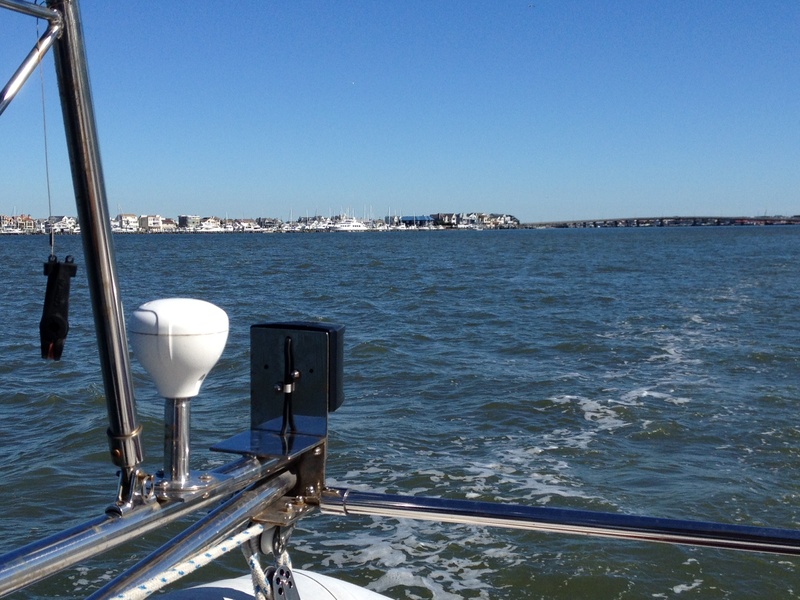 Over the Bay and Through the Canal to Albemarle Sound We Go! We’re heading south! 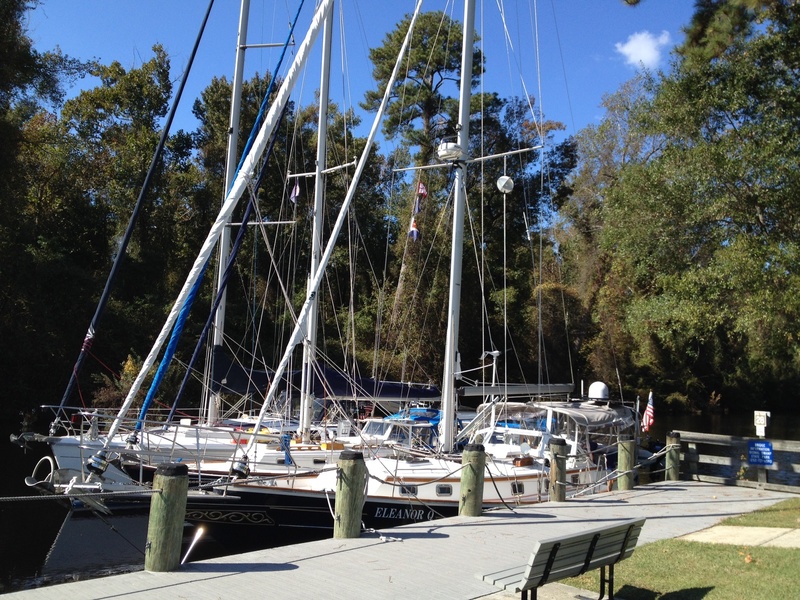 And a good portion of our route for the next several weeks will be via the Intracoastal Waterway (ICW). Frank has had this route in his head for years, but being me, I couldn’t have spit out a good explanation of what it was or WHERE it was until more recently. (I tend to plan in shorter time spans; we’re different that way). So if you’re a little sketchy about it, let me give you a brief orientation to set the scene. I will borrow a few (edited) lines from the CruiseGuide for the ICW that we are using put out by Mark & Diana Doyle – a most excellent companion to our travels! 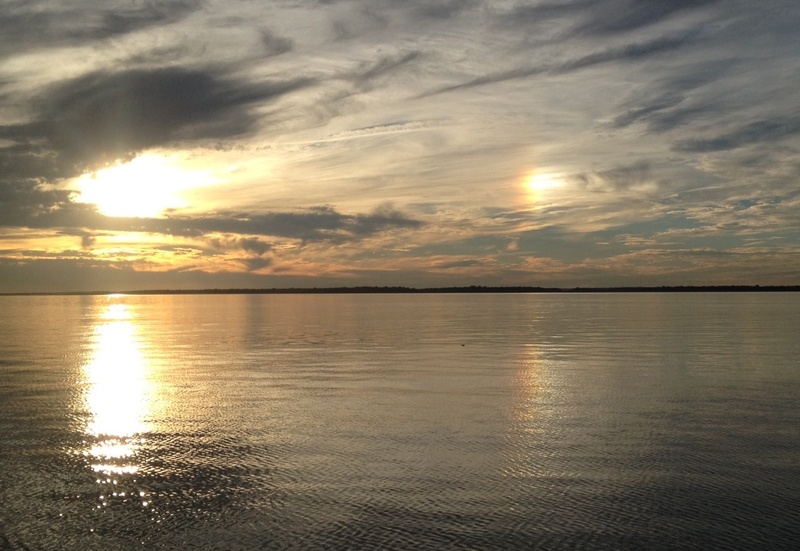 The ICW is a navigable inland passage along America’s Atlantic and Gulf coastline. 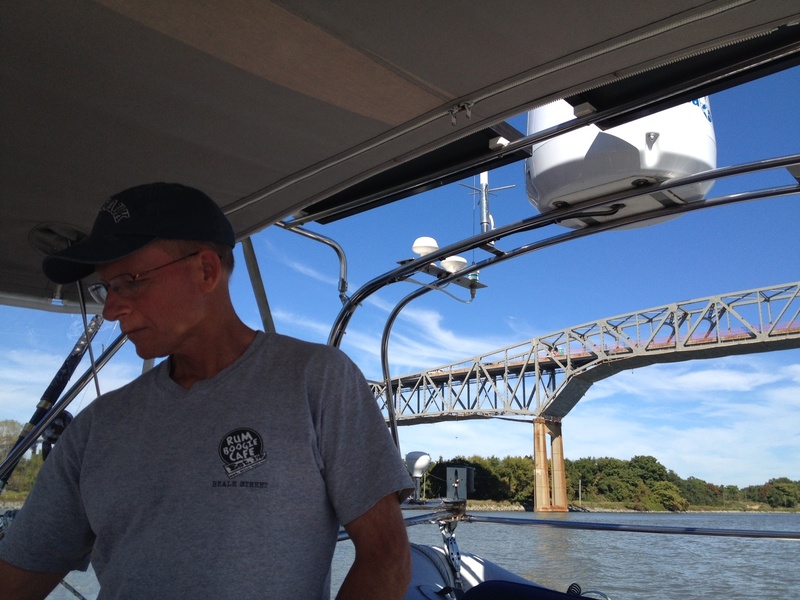 Officially it spans from just north of Boston to Brownsville, Texas, although when people think of the ICW mostly they think Norfolk to Miami – the 1,098 miles with the most traffic. 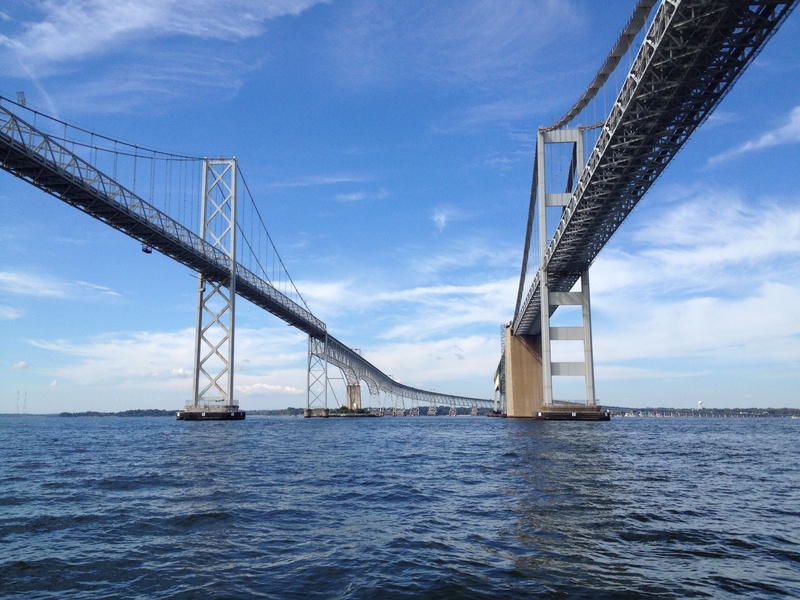 Part of the ICW is made of natural, God-given waterways (for example, the Chesapeake Bay is considered part of the ICW); other parts are manmade waterways that connect the natural ones. This continuous inland waterway was created primarily to improve commerce by making a more easily navigable and less treacherous route that was an alternative to having to stay in the Atlantic Ocean to get north and south. 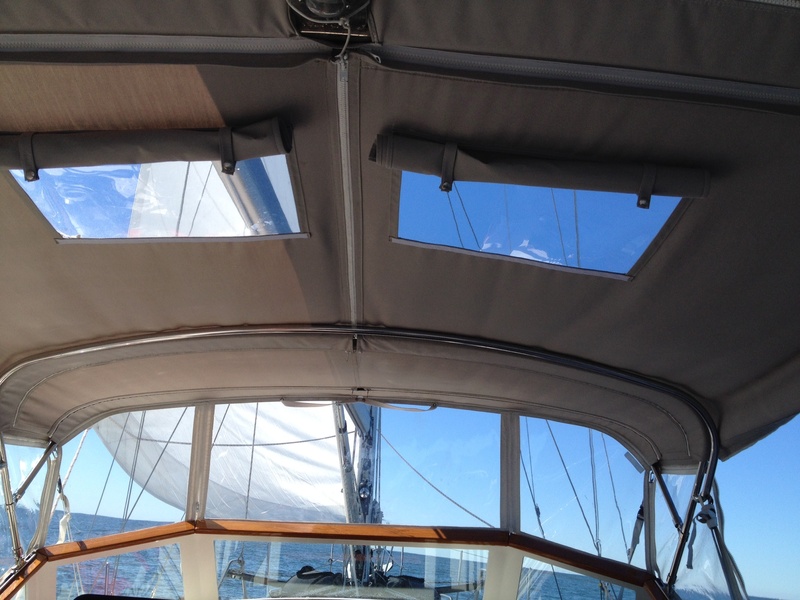 #1- Going on the outside: This is a term that you’ll hear cruisers use with each other a lot, as in, “Are you going inside or outside?” “Outside” means you are staying out in the Atlantic Ocean and making passage down the coast. 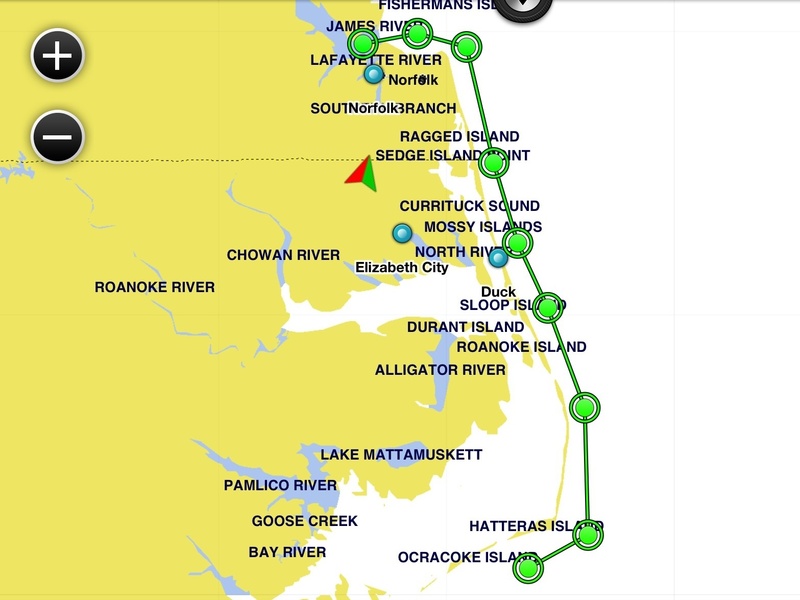 This is a rougher ride, more difficult , and not as many places to “land” meaning longer trips, some overnight passages and more weather concerns. It is certainly faster, but that’s not always what you want. 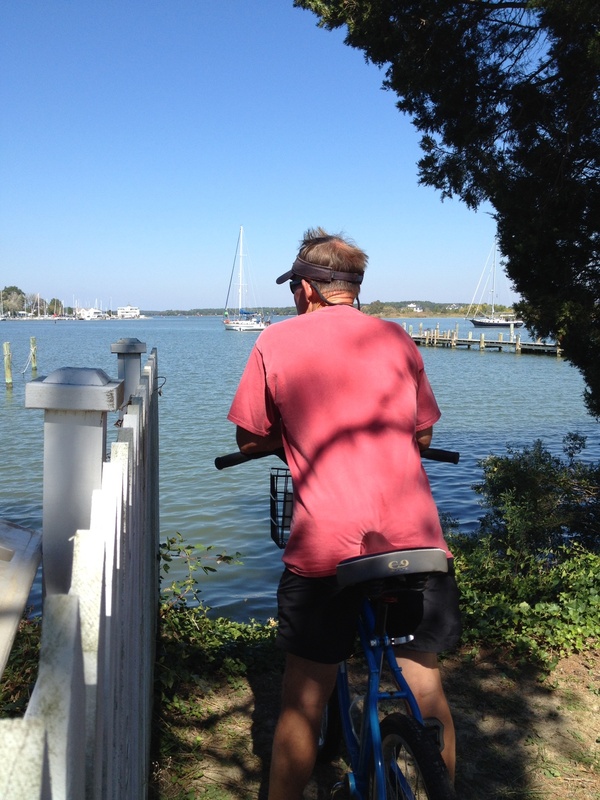 #2- Taking the ICW from Norfolk, but taking what is called Route 1 – the Virginia Cut. 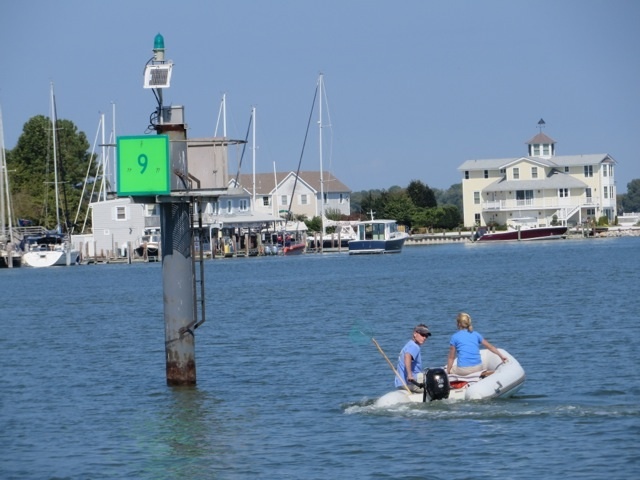 This route is used by commercial and recreational traffic and is kept at a depth of at least 12 feet. 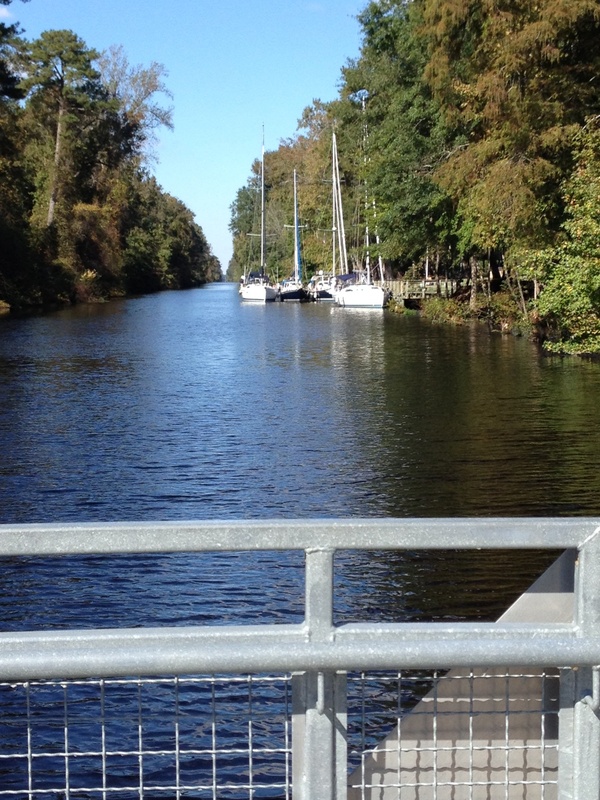 #3- Taking the ICW from Norfolk, but taking Route 2 – The Dismal Swamp Canal Route. 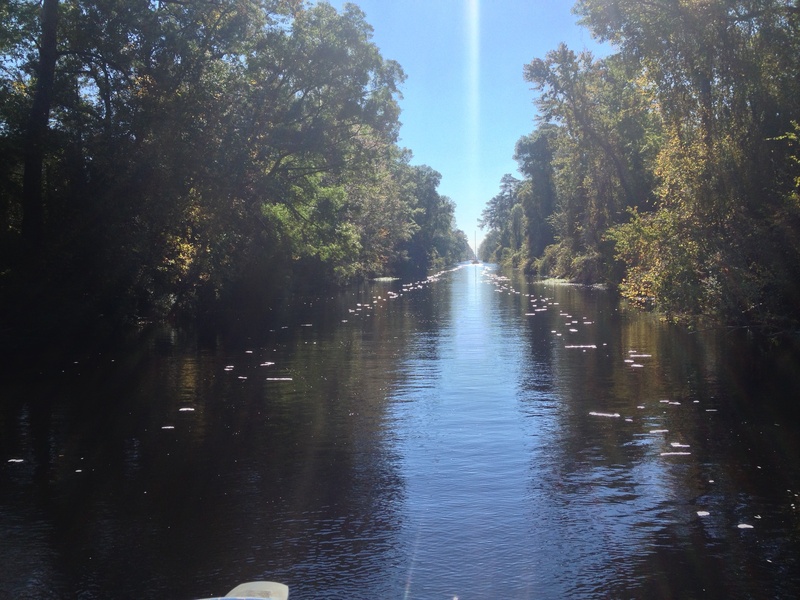 There is a great debate amongst boaters as to whether or not to do the Dismal Swamp Canal. 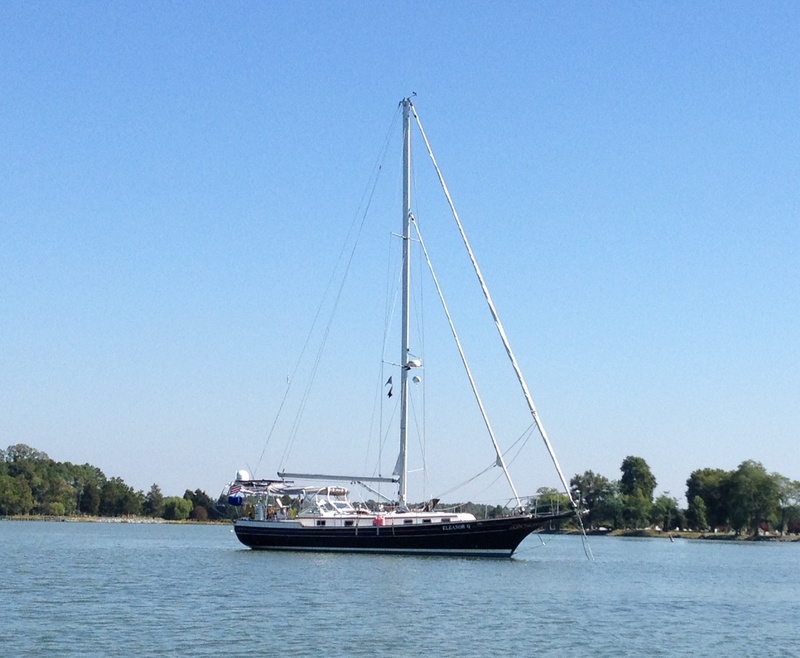 Reasons NOT to: it is shallow, it is skinny, it is slower, you can’t put your sails up and some people think it is boring. Reasons TO go: it is scenic, it is historic, it is slower and then you can say you did it once! We did the Dismal. And we loved it. And we’d do it again, by golly. But I’ll come back to the canal in a minute. 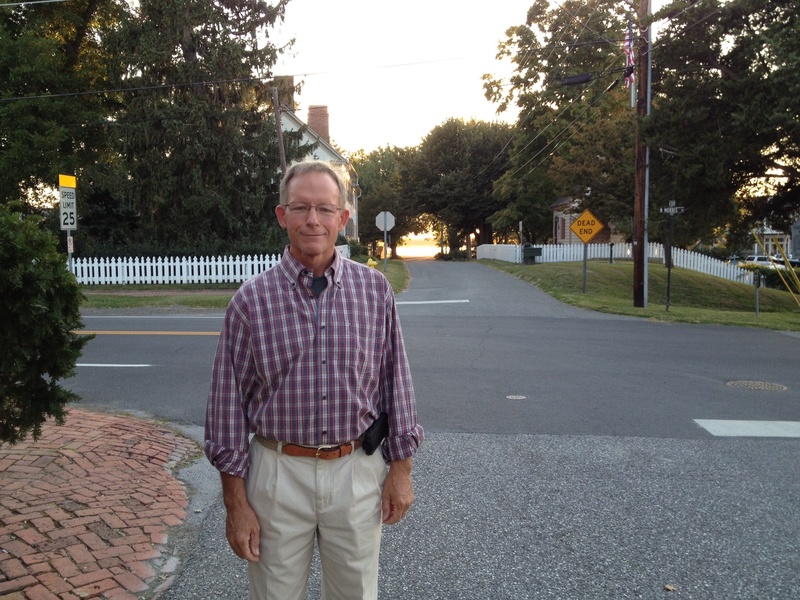 First we had to get from Hampton, VA to the canal. 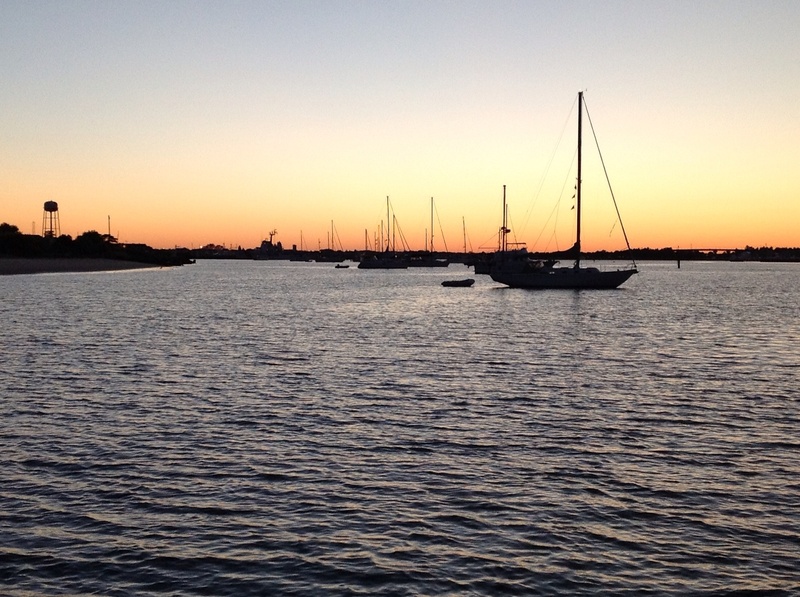 We left Hampton and took a most interesting ride past the major Naval base in Norfolk. 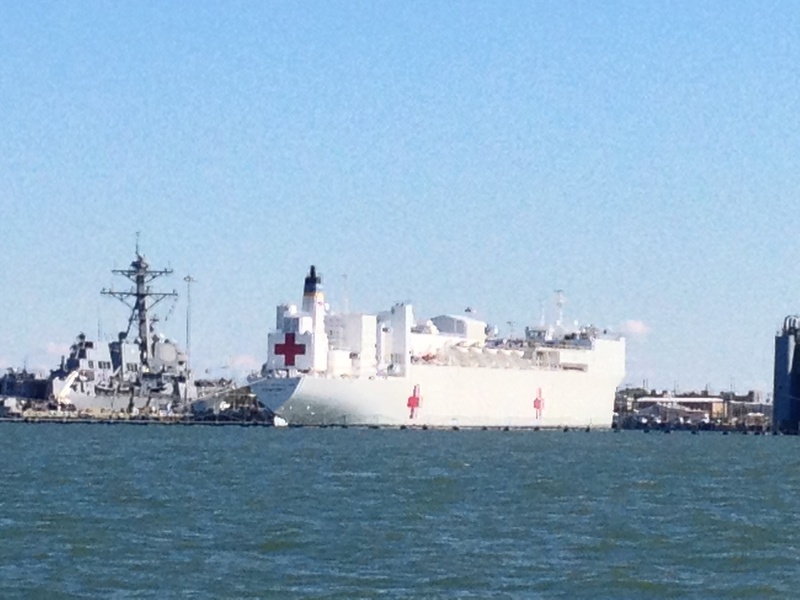 There we saw more aircraft carriers, the USNS Comfort (hospital ship) and A SUBMARINE! You just don’t see one of those every day! 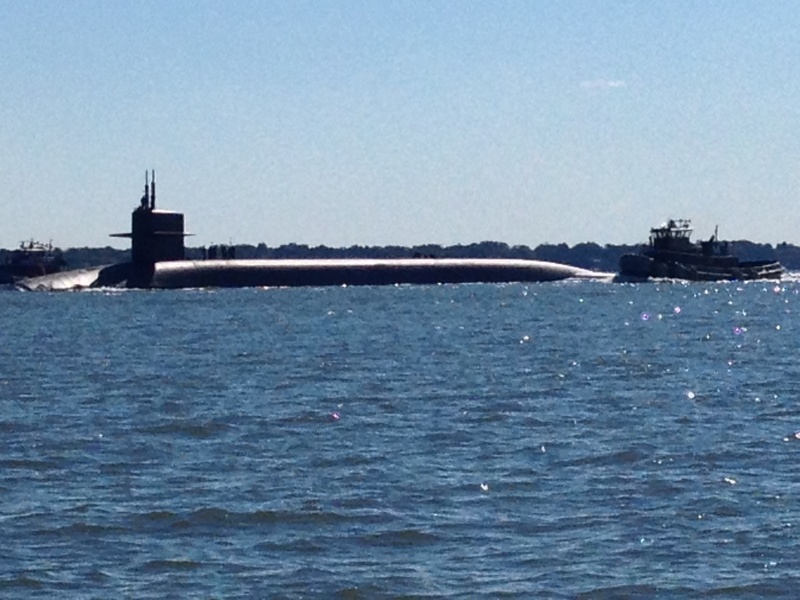 I (Ems) took the boat out of the Hampton City Dock and navigated past the base, around the submarine, into the river by Portsmouth dodging tugs and ferries and all other sorts of water traffic. 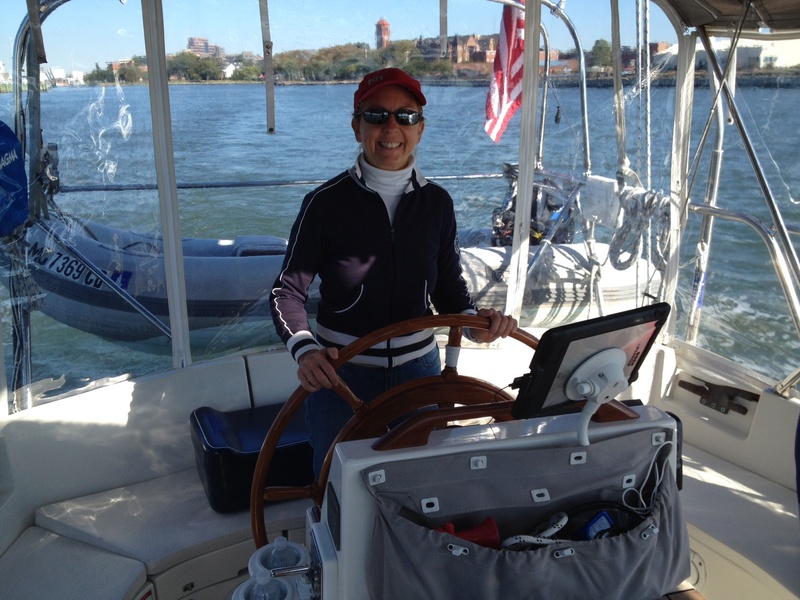 Some of my maneuvers were less than elegant, but I DID it and learned much along the way with the help of my personal nautical coach. 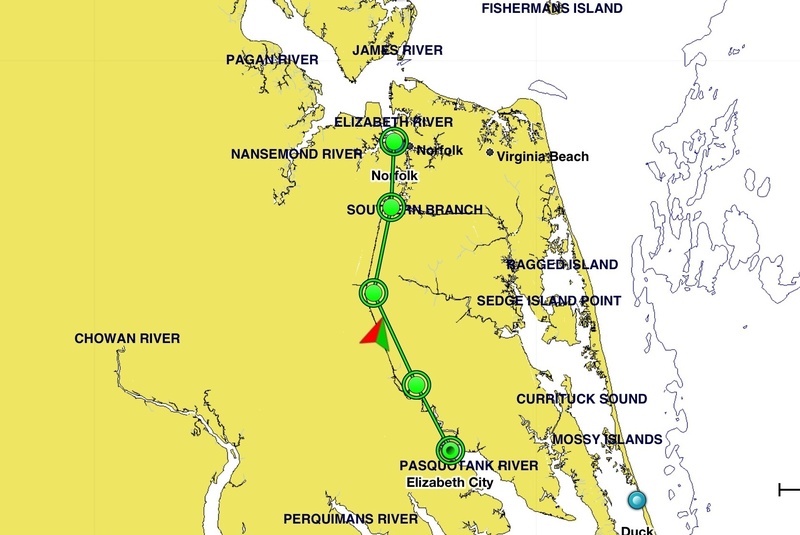 Ems at the helm from Hampton through Norfolk, VA.
Wonder if the people stationed here ever sing, “We All Live in a Yellow Submarine”? I wonder these things . . .
USNS Comfort – the designation means it is a non-commissioned ship owned by the navy but staffed by civilians. It is a mercy ship and firing on it would be considered a war crime. Among others places, it has been deployed to NYC on 9/11, Katrina, Haiti as well as various war zones. 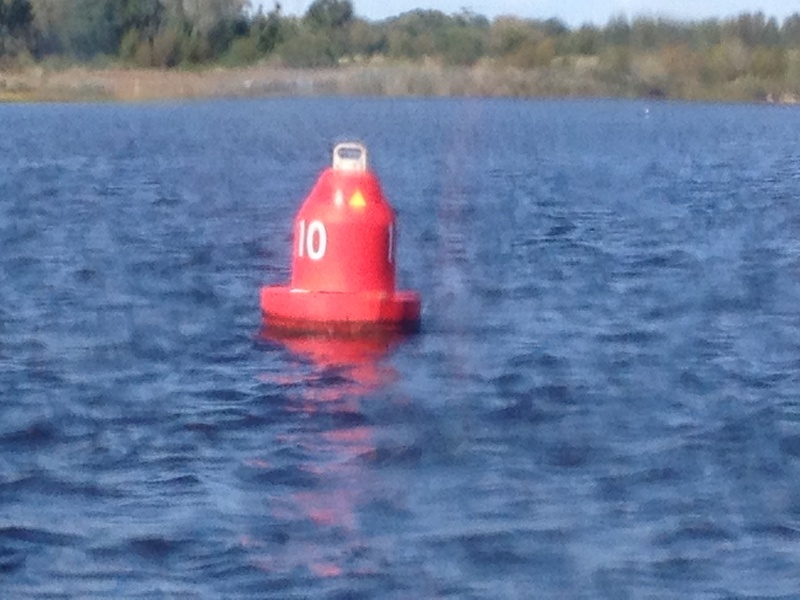 And then, there we were at mile marker “0” in the ICW! Woo hoo! 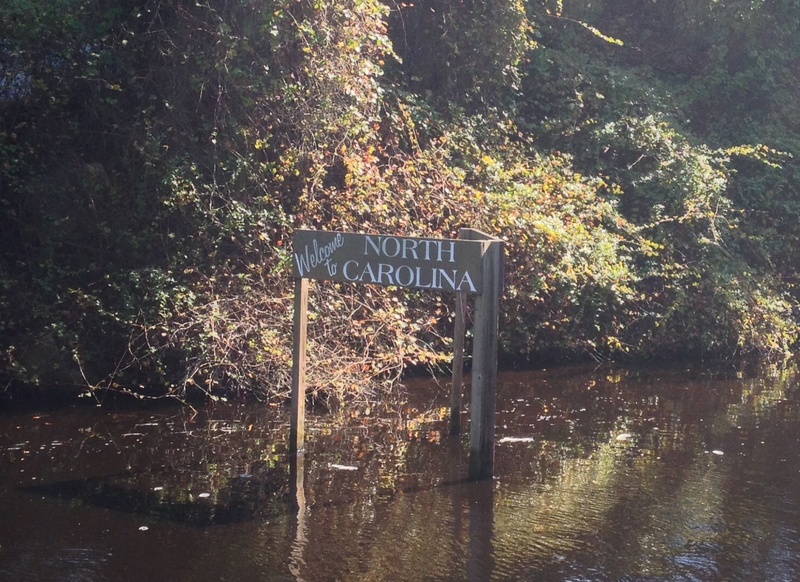 The ICW is sort of like New Jersey when you ask “what exit are you from?”. 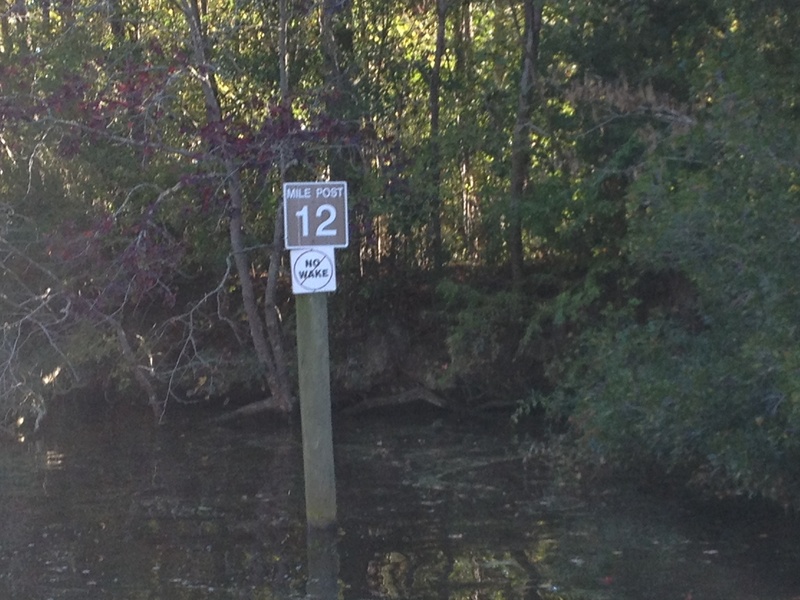 The ICW is all about the mile markers. 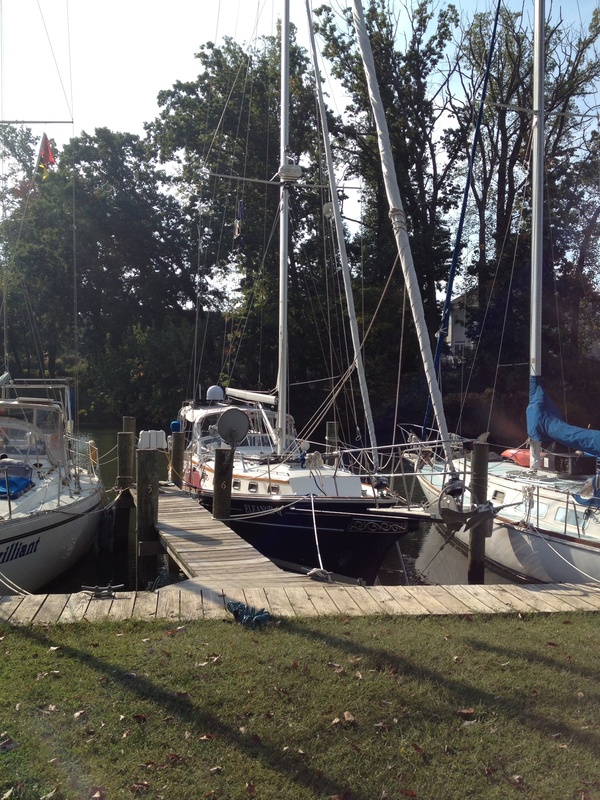 We came to the split where you have to decide if you’re doing the Virginia Cut or the Dismal Swamp Canal. We turned right for the swamp. 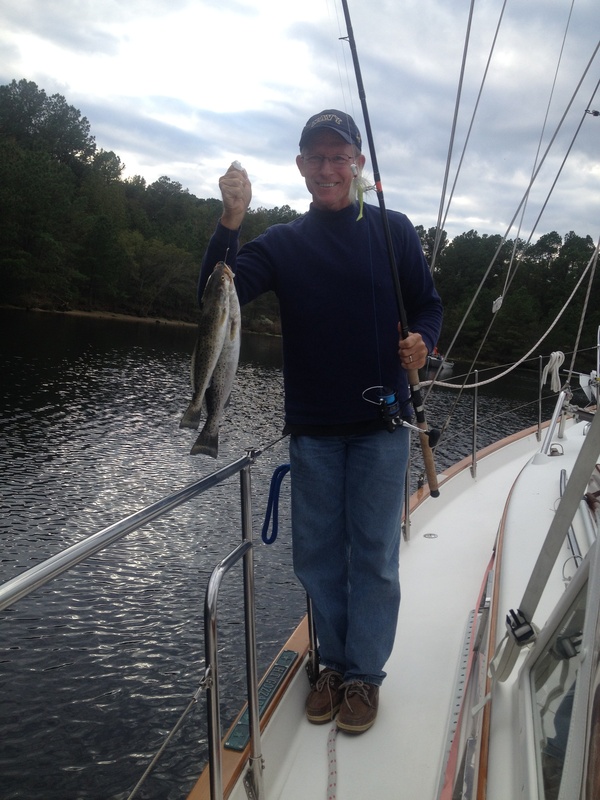 Shortly after the fork in the road, we anchored up in Deep Creek Basin with one other boat; however, there were a number of small fishing boats there for the day catching a multitude of speckled trout. One of the fisherman shared two of his trout with us in exchange for a Budweiser. We definitely got the better end of that deal! Mile Marker “10”! The yellow triangle indicates an ICW marker. Frank holding our “catch” – that’s all I’m sayin’. That was some GOOD eating that night! We had to time our departure the next morning to catch the lock. Yes, the canal has a lock, then a drawbridge . 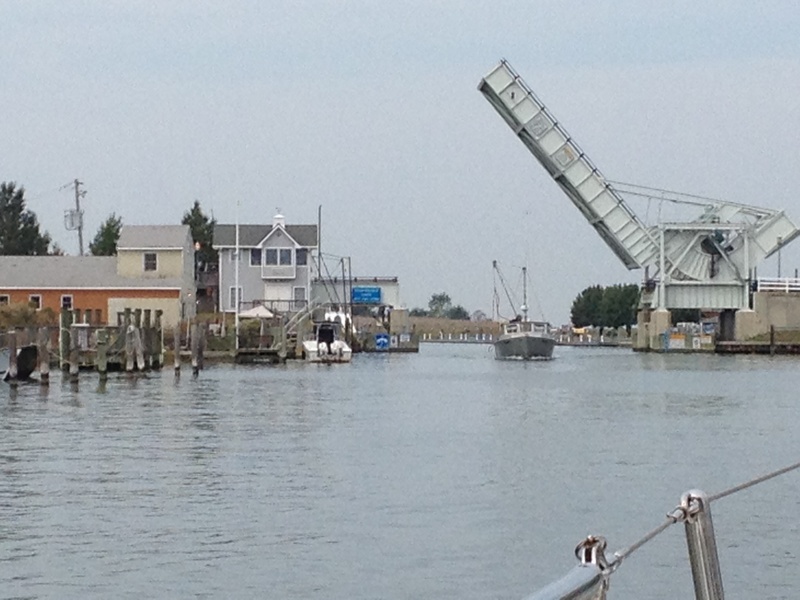 . . then further south a drawbridge then a lock. Going through the lock was a new experience for us. Locks connect sections of the canal that are at different levels. We had about 5 boats in the lock. 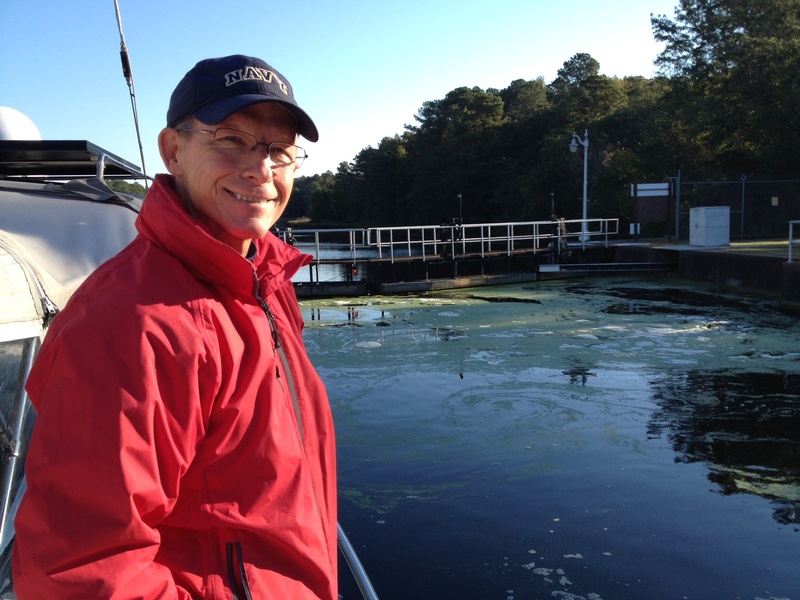 The boats all go into the “pen” together, the gates close behind us, and then water is allowed into the lock. There are no pumps – it is all done by gravity. The crews on each boat (us) are handling lines . 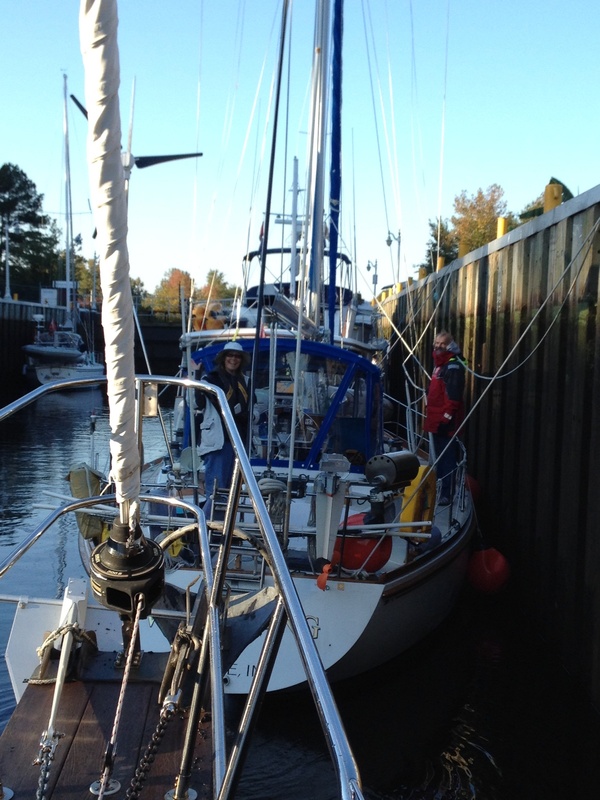 . . we have lines looped around pilings on the side of the lock, but as the water rises, you have to keep pulling your lines in to keep them taut and your boat in place so you don’t bump around the other boats. (This happens in reverse at the locks on the other end . . . the water level in that lock drops.) Then the lock-tender changes jobs and becomes the bridge- tender. No kidding. He finishes the process with the locks, opens the gates to let the boats free from the pen, then jumps in a vehicle and drives the short distance down to the bridge to open it for the boats coming from the locks. 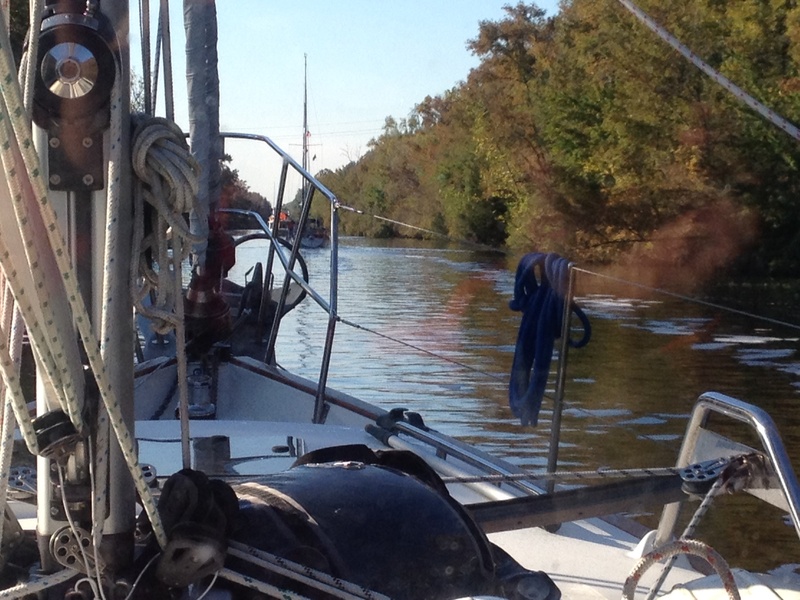 And as we passed under the bridge, we were in the Dismal Swamp Canal! Driving into the locks. . . The gates closing behind us. 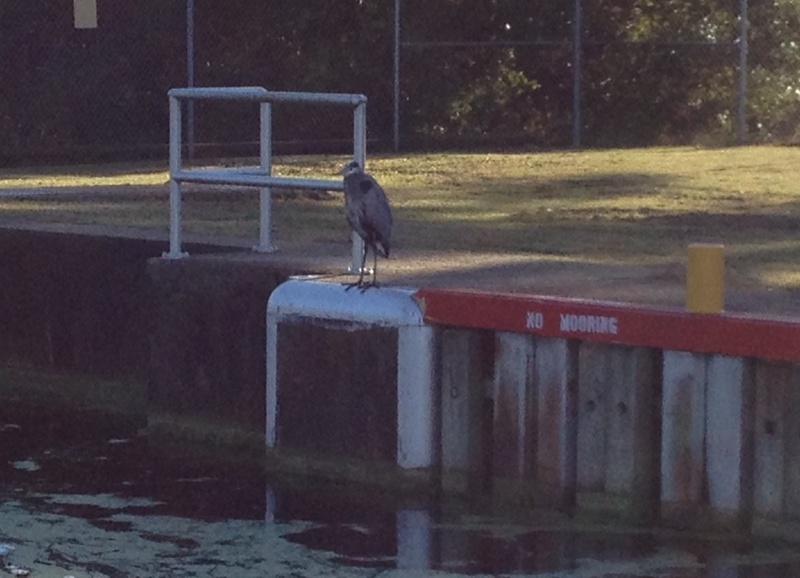 A heron observing the operation and clearly ignoring the sign. Going to the draw bridge . . . 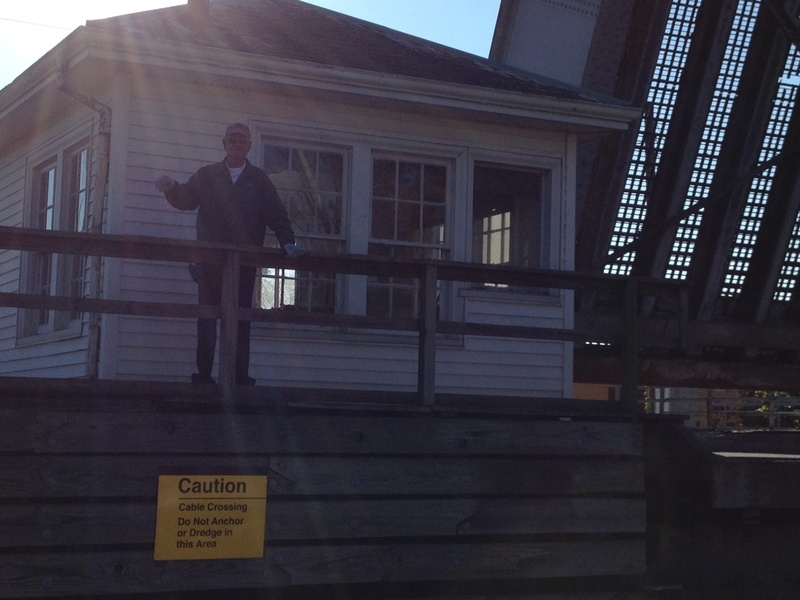 Thanks Mr. lock tender/bridge keeper! Brief history: The canal opened in 1809 and was largely hand dug by slaves in most difficult conditions. Because it was so shallow, only flat boats or log rafts could be manually poled through, typically carrying shipments of logs, shingles and other wood products from the abundant cedars and junipers. The slaves became so familiar with the route that it was widely used as a slave hideaway and became an important part of the Underground Railroad. It has been the inspiration for literature, poetry and songs. The Army Corps of Engineers is responsible for the upkeep of the canal, keeping it at at least 6 feet in depth. There are times when the canal is closed due to drought conditions. Recently, cruising friends of ours were turned away from the canal due to an overabundance of duckweed – a green plant with little teeny leaves. Due to some unusual and extended wind patterns, an excessive amount of duckweed had collected close to the top of the canal. The duckweed gets sucked into your intake for the engine, the strainer gets full of it and chokes the water/air supply to the engine which then overheats and eventually stops working! They had to tow many boats out. So they turned people away from the canal for several days until they could clear the overabundance of duckweed. Here I am steering on my tiptoes so I can see if we’re about to hit any logs or stumps. 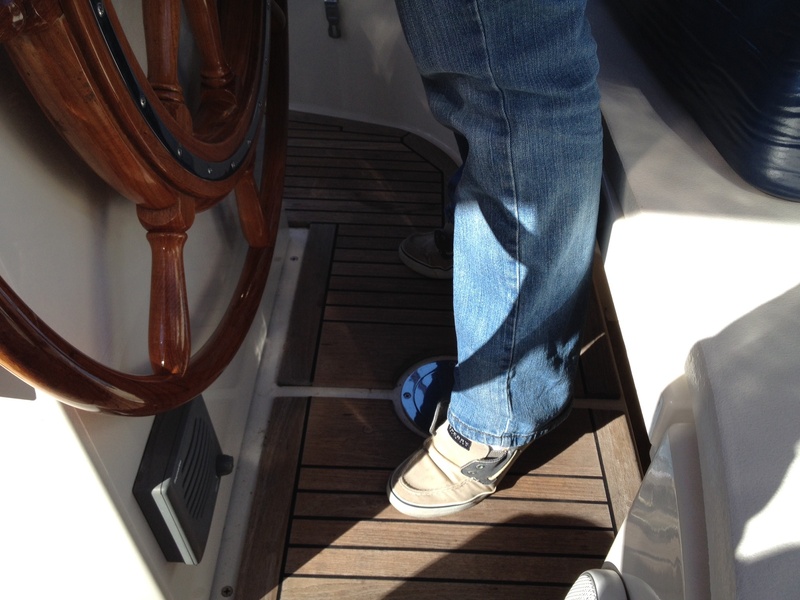 I will make my millions inventing platform boat shoes for women. 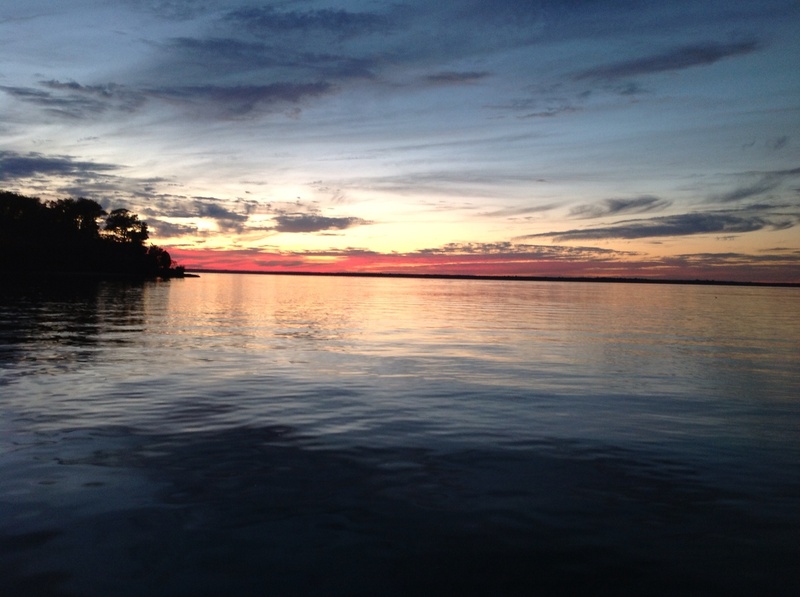 Frank took this beautiful shot from the bow as we traveled down the canal. 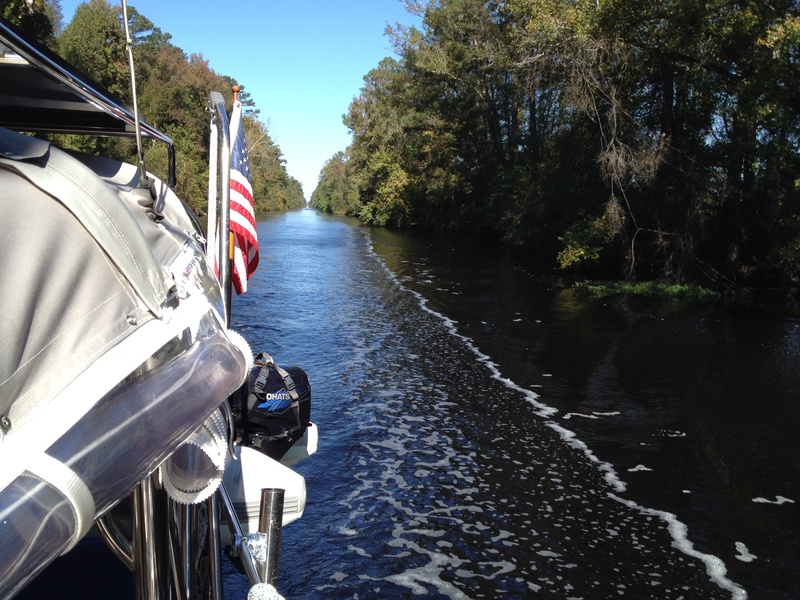 After going through the first set of locks and heading into the Dismal Swamp Canal, we were reading up on things to see and do along the route. So, we decided that, rather than push on to Elizabeth City, we would stop at mile marker 28 at the Dismal Swamp Visitors Center which is a rest stop for boats on one side and cars on the other!! Seriously, if you’re driving down State Route 17, this is a rest stop. 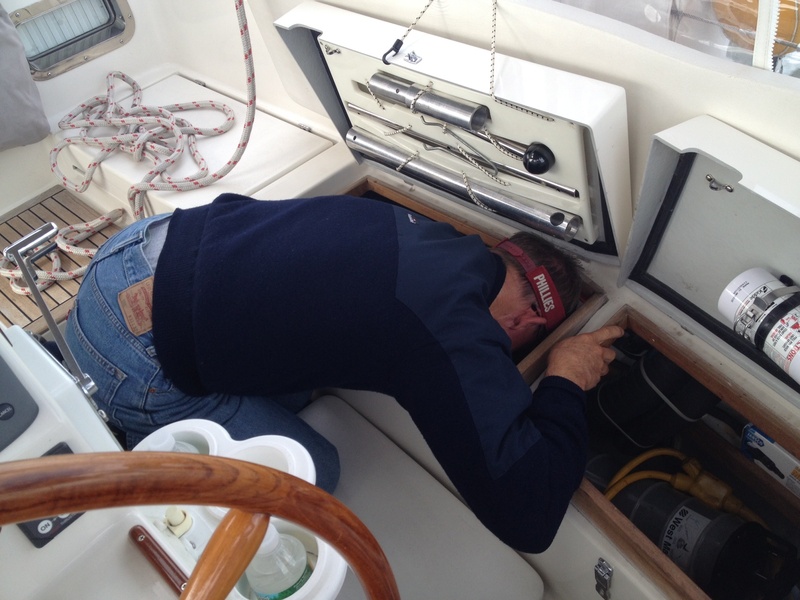 There is a free bulkhead to tie up to, and we decided that we would S-L-O-W D-O-W-N and avail ourselves of the facilities. So having read up on the place, we were prepared for the protocol here, which is . . . boats raft up to one another. We got a spot on the bulkhead and then waited for neighbors. There is room for three boats to tie directly to the bulkhead – then everyone else ties up to the boats that are already there. Then the accepted action is that you just walk across each others’ boats to get to land (always around the bow – never through the cockpit). Meanwhile, the people in cars that stop here come over to the bulkhead to see the boats, so the raft up is, itself, a tourist attraction for motorists. We chatted with many interested and friendly people! Needing some exercise, we went across the pedestrian drawbridge to the state park and took a couple mile walk. 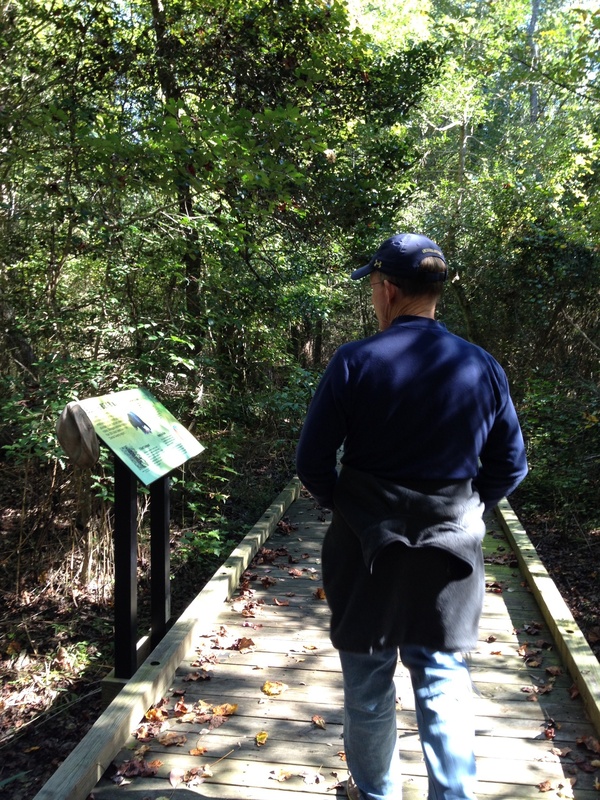 The park has a beautiful visitor/nature center and great trails. Three deer hopped out on the trail and looked like they were going to walk right up to us! We returned to the boat and watched the rest of the rafting activities. By sunset there were 13 boats meaning we were rafted 4 or 5 across. If you put two more boats beside those four, you’d be able to walk across the entire canal. 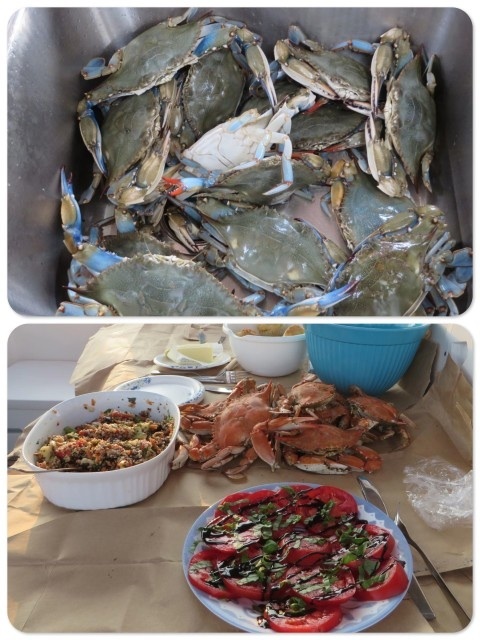 After chatting with the other boats in our flotilla of four, we suggested a potluck dinner on Eleanor Q. 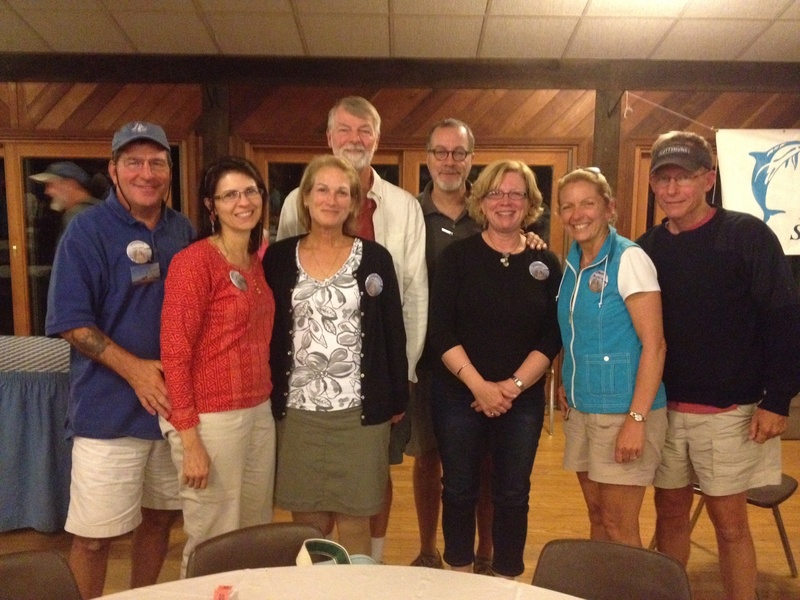 We had a GREAT evening with nice people, fun conversation and lots of laughs. How cool is that? 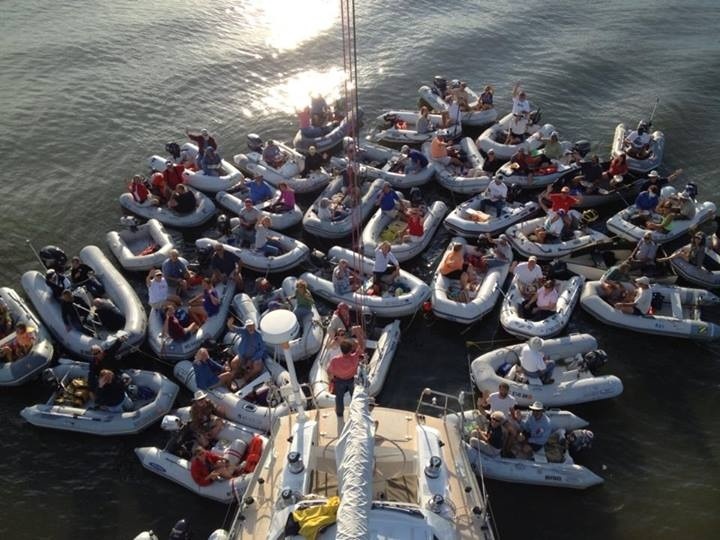 Too funny how this cruising community is like one big constant floating pot luck party. People talk to each other like they’ve known each other for years . . . no one gets funky or territorial about people stomping across their boats . . . it’s actually pretty cool. Maybe more parts of life should be like this. This was the view from the pedestrian bridge walking to the State Park. Only a couple of boats parked with Eleanor Q at this point. A stroll through the state park. Watch out for bears! In the park . . . a still. Really. Well, maybe a replica. 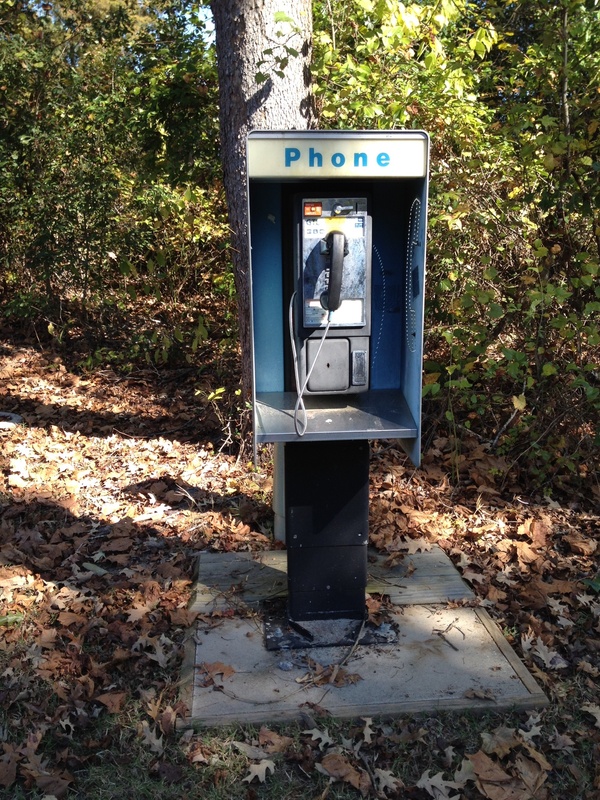 Also in the park – when was the last time you saw one of these? Our happy little raft up! Neighbors for the evening. That night was a record breaker for us: the low was in the upper 30s. We had every blanket on us that we own and were very cozy. We have a propane heater that we kept on until we went to bed – not safe to keep it on all night. In the morning it was 49 degrees in the boat. Good news is that between turning the heater on and lighting the stove for our coffee, it warms up pretty quickly. Morning mist on the canal at the visitors center looking out the back of the cockpit. 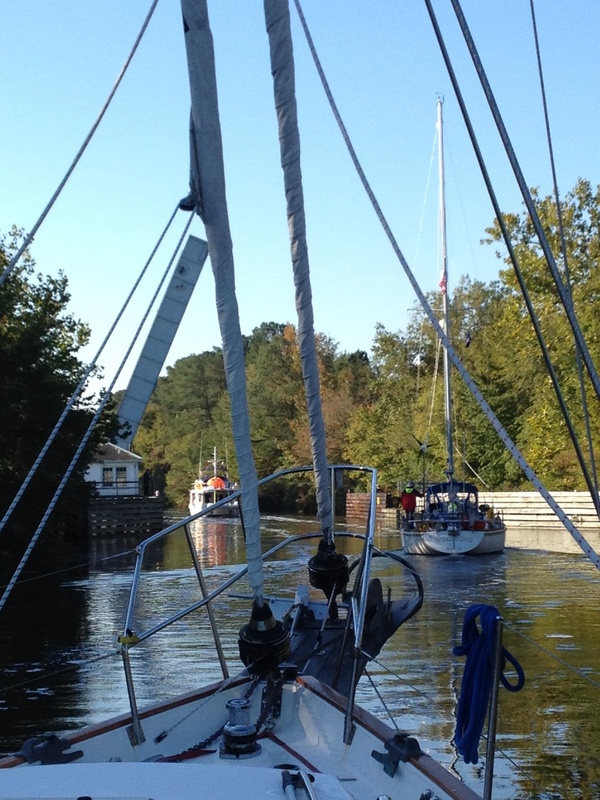 And then we were off to finish our Dismal Swamp Canal trip. 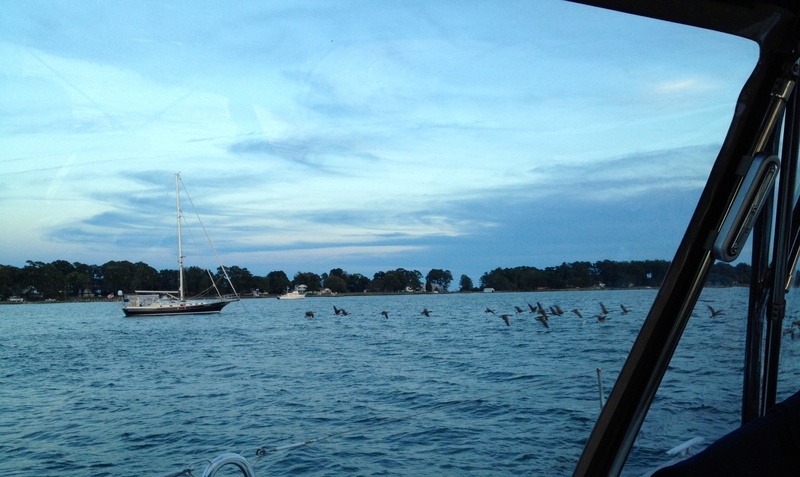 Considering that you have a pack of boats tied together, everyone has to discuss and coordinate a departure time. 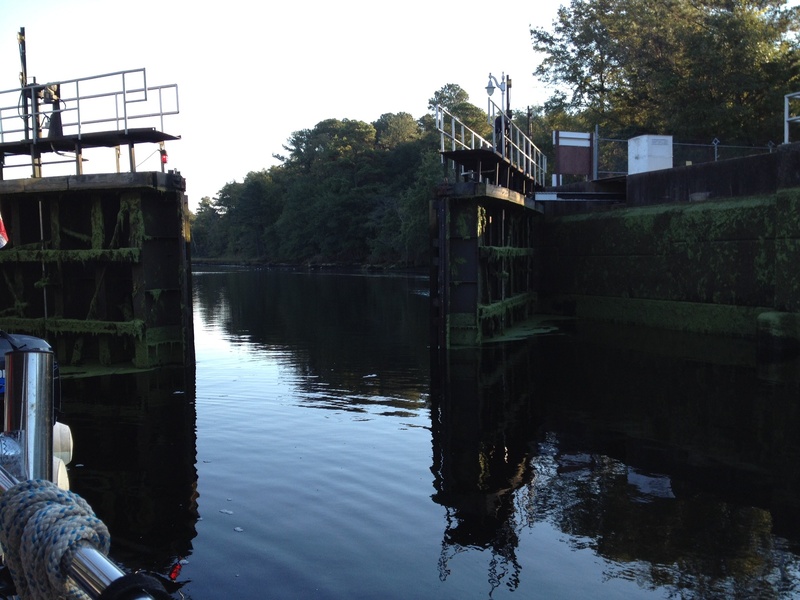 There are only four lock/bridge openings a day, so again we had to coordinate that. Our line opted for a 9:30 departure to catch the 11:00am opening as did the front line. 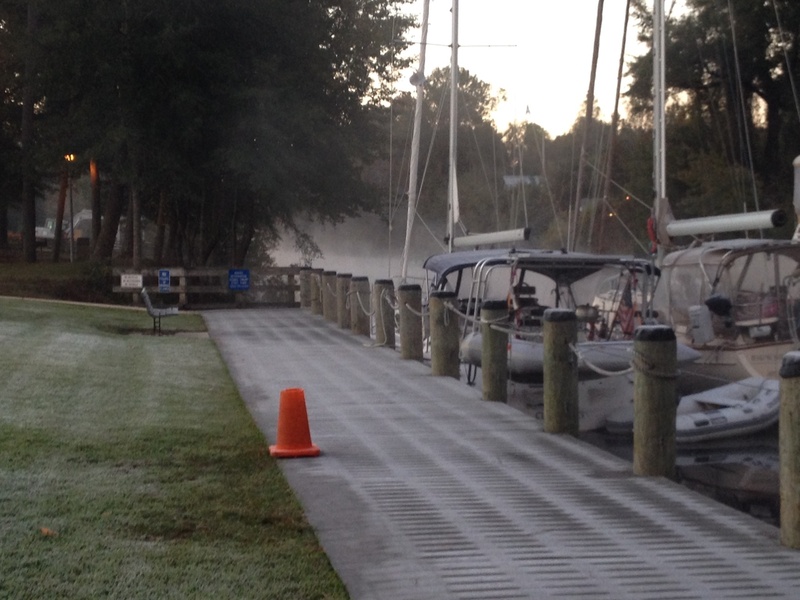 The middle row of boats were the early birds. The rest of us were happy to let the sun warm the place up a little more before we had to go face being in the cockpit! 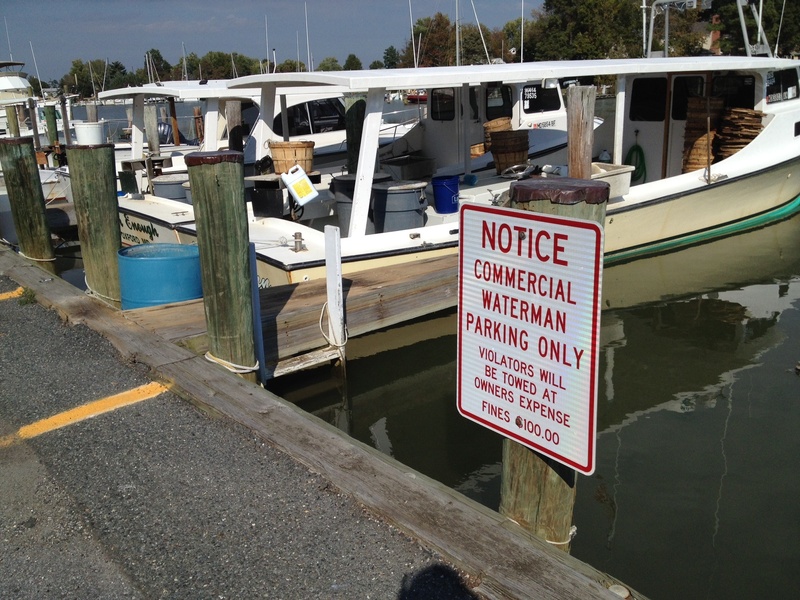 We made it to Elizabeth City about midafternoon and were able to secure one of the free slips at the Wharf right in town. A number of the boats from the Visitor’s Center also went to Elizabeth City, so we had a chance to get to know each other even more for the next couple of days, but more on that next post. And so begins our tour of North Carolina and it’s southern hospitality. There was nothing dismal about this portion of the trip! 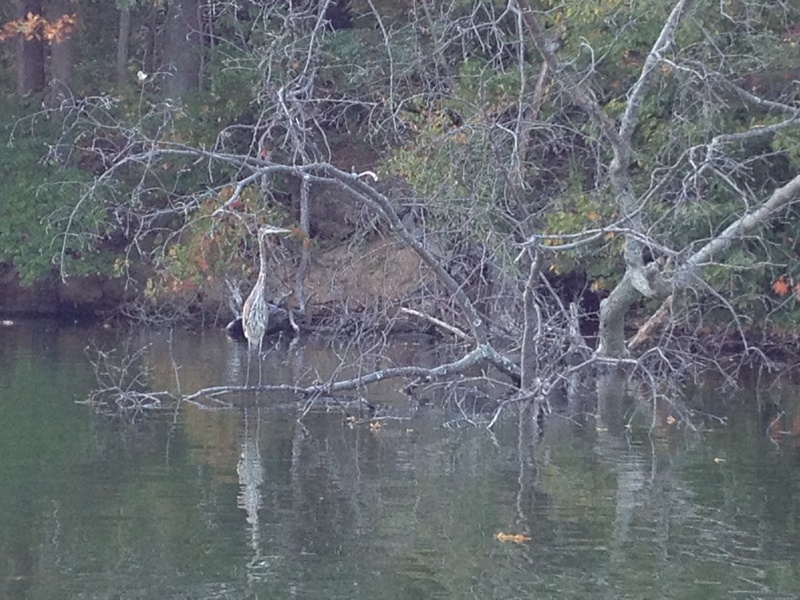 A blue heron in the bushes. After a couple of nice days in the Wye, we headed back to our old stomping ground. 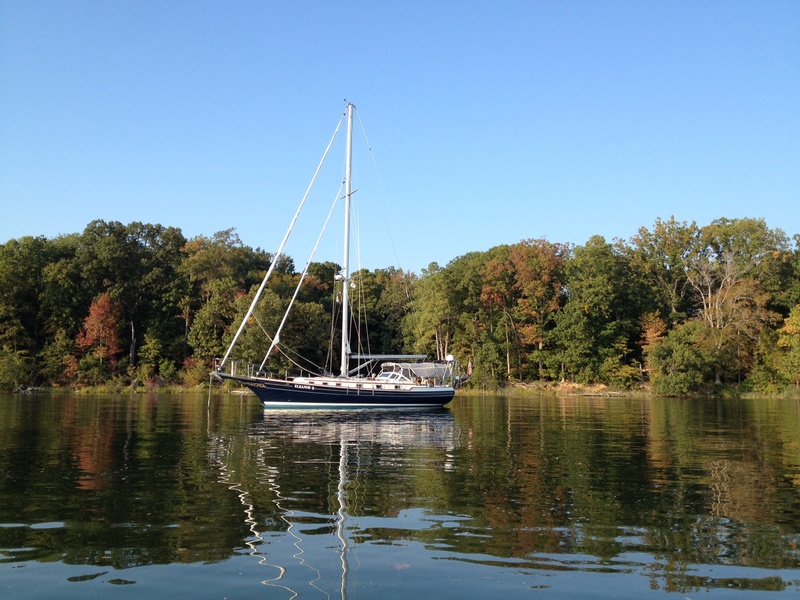 It was a beautiful October Saturday meaning that the bay was PACKED with boats. 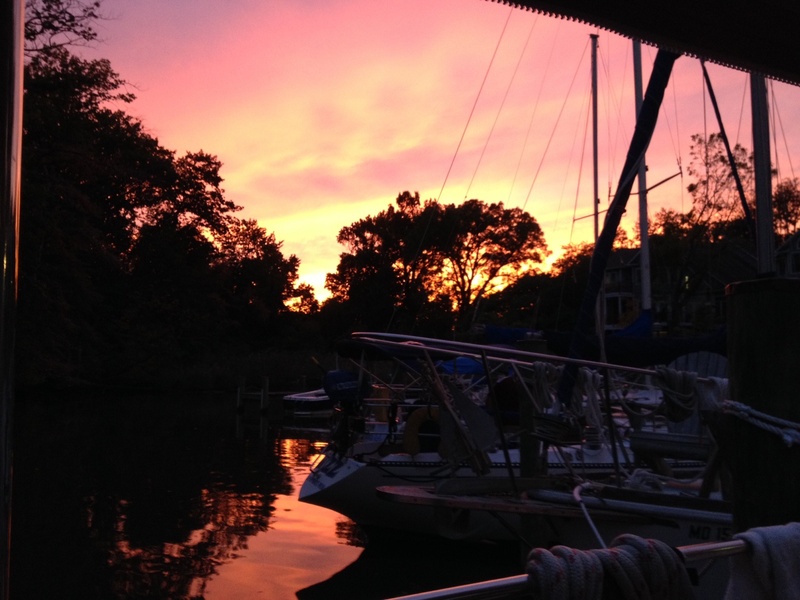 We steered our familiar route right back to our old marina. 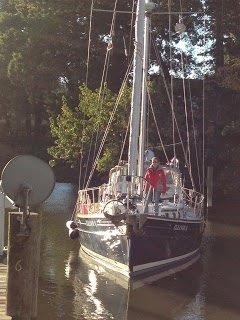 Dean, owner of Stella’s Stern and Keel, had an open slip that we were able to rent for a couple of weeks, and when we pulled in it was just like we had left it . 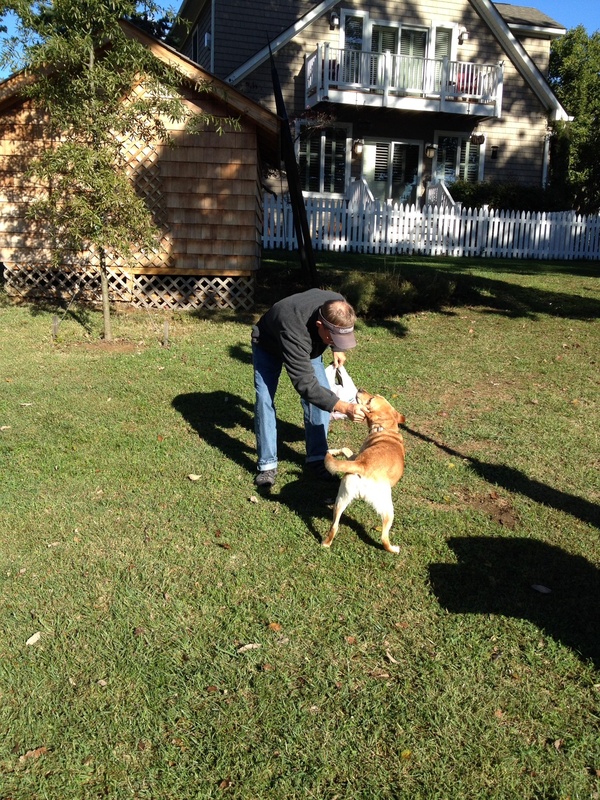 . . there was Dean in the yard ready with a hearty welcome and Buttercup, the yellow dog, with her mom/owner, Suzanne. It was a very welcoming feeling and we were excited to be back in our old stomping ground. Stella’s is at the end of Jones Cove in Back Creek. At the very end of the marina is a heron refuge. It is beautiful and peaceful back there! 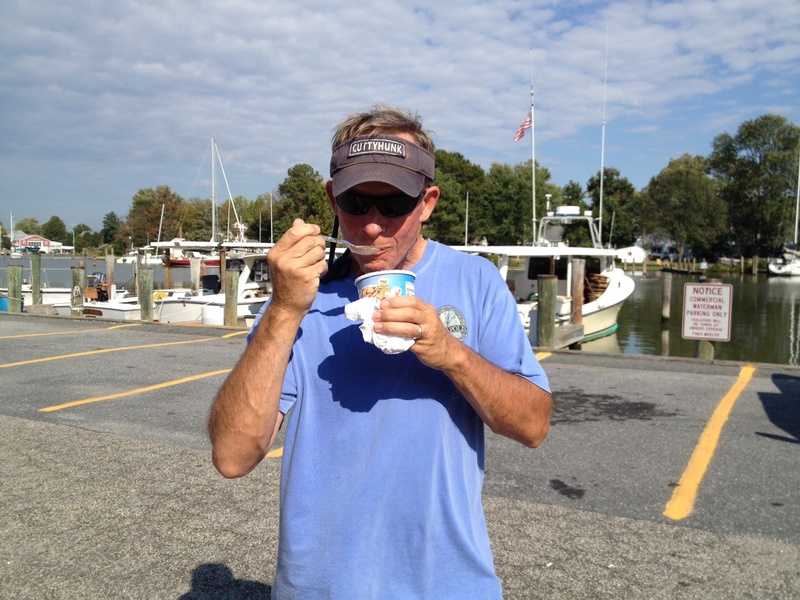 We spent our time in Annapolis seeing friends, readying the boat for our trek south and visiting the boat show which gives us a chance to catch up with Mike, Liz and Robyn Gozzard, the builders of our boat. 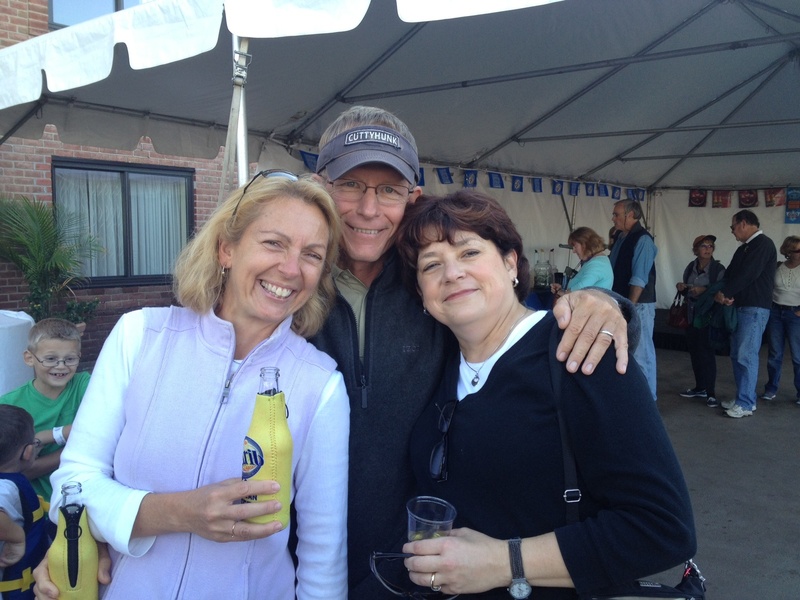 We met up with friends which included a “chick day” at the Boat Show with Cheryl! 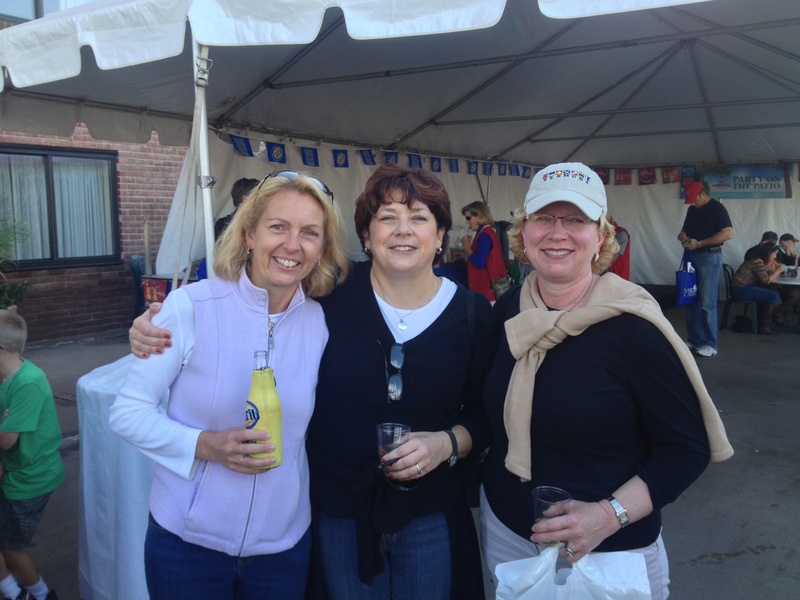 And sister Caroline met up with us at the end of the day, too! (That’s Ems sister Caroline – not like a nun or something.) 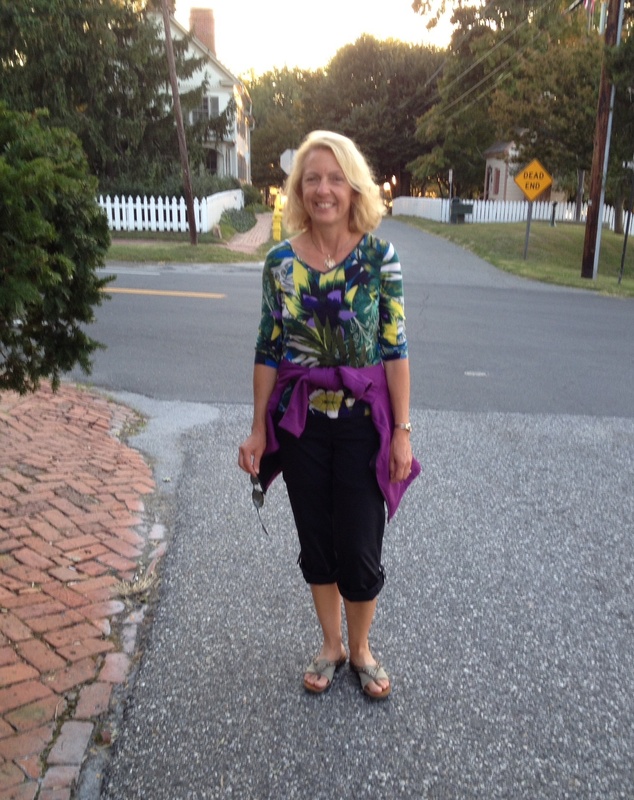 Caroline brought a delightful dinner with her and then helped with a major grocery run the next day. 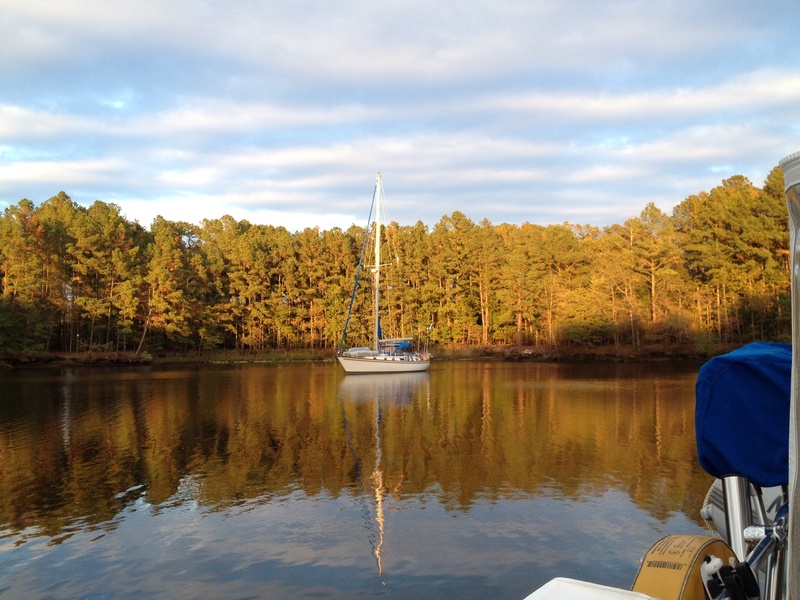 Our very dear friends, Tom and Cathy, have a Brewer sailboat that they have been lovingly restoring over the last several years. 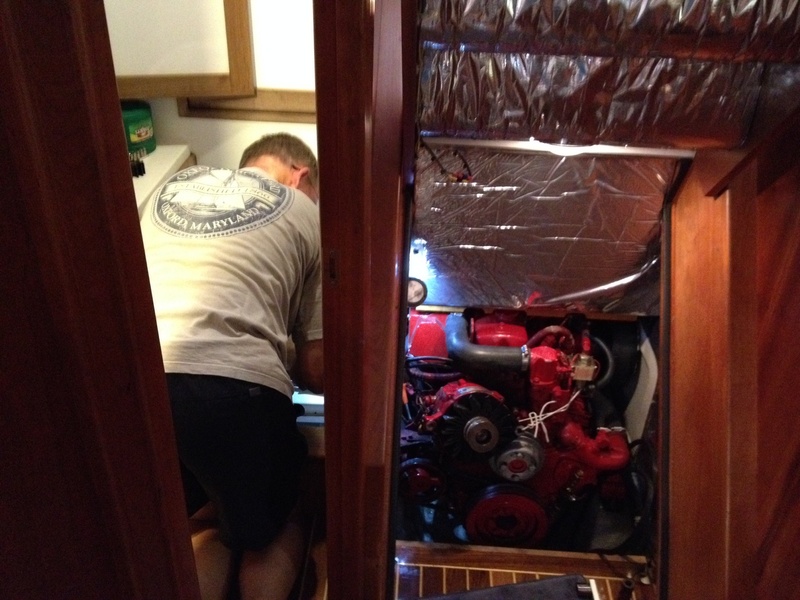 We spent time catching up with them and seeing the fruits of their labor as they get ready to move aboard! They were our neighbors at Stella’s our first two years there and we have watched each others’ projects and preparations as we shared the cruising dreams over a beverage or meal. The offers of rides and help and errands from many was heartwarming, and we are always grateful for them! Oh – the ever present laundry backpack appears. Guess what today is? 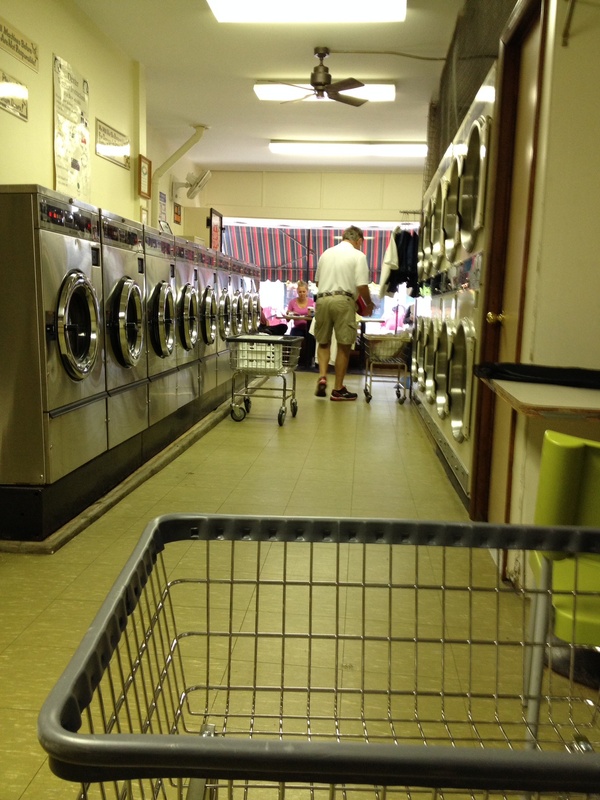 Maryland Ave. laundromat is a dream, and the day we were there, it was a cruiser’s party! It made laundry day fun, if that’s possible! 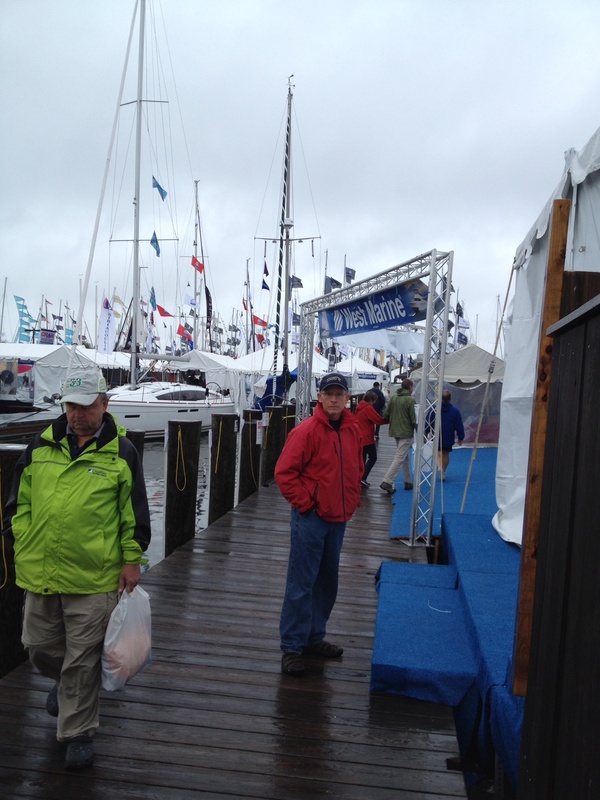 Boat Show – an annual pilgrimage. Cheryl and I trolled the boat show. Caroline met up with us for a perch at the Marriott to watch the parade of boats leaving the city docks as the show breaks down – an event! Okay, we let Frank come, too. After seeing the pictures from the previous days, I realized how badly in need of a real salon I was. Especially since we were going to my mom’s birthday party! Bleached blonde no more – for a while. I will give up real salons soon , I promise. We rented a car which we used to do a visit of the Mamas! 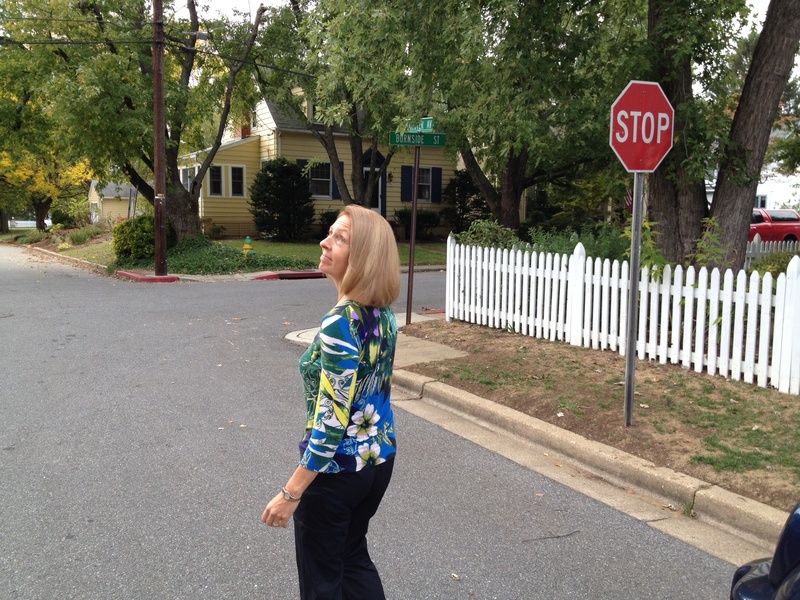 First stop, a nice visit with Frank’s mom and bonus fly-by with two nephews while there! Always good to “chat with Pat”! Then we drove to attend Mama Rapking’s 90th birthday celebration. 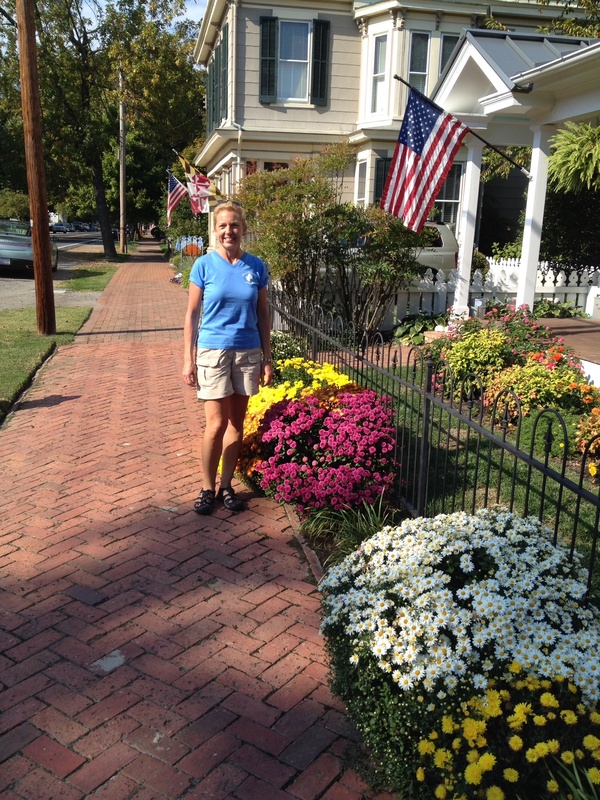 (That’s Ems’ mother – and yes, that is really my maiden name . . . ) All six children came in from all over the country to recognize this happy occasion! 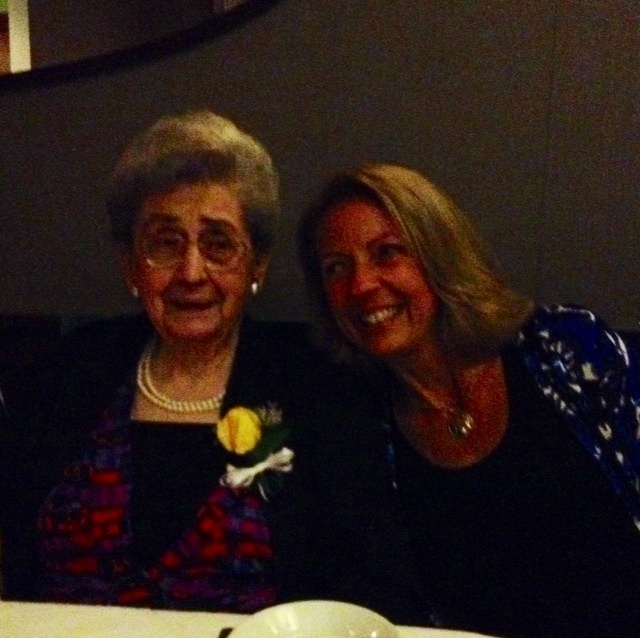 As I like to say, my mom is 90 going on 70. Not that I am at all biased, but she is spunky, witty, affectionate and independent and we love being around her. Frank and I made use of her spare bedroom . 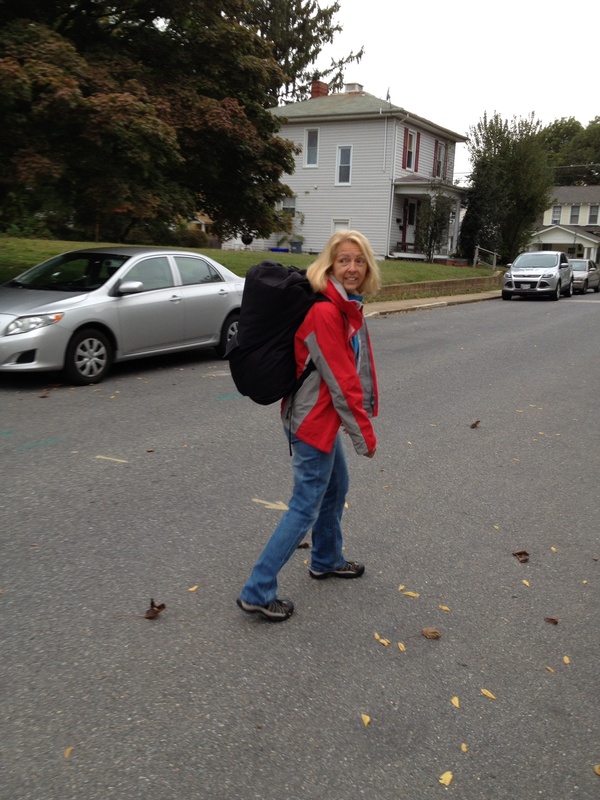 . . and I asked her if we could pretend I was in college again so I could bring my laundry with me!! 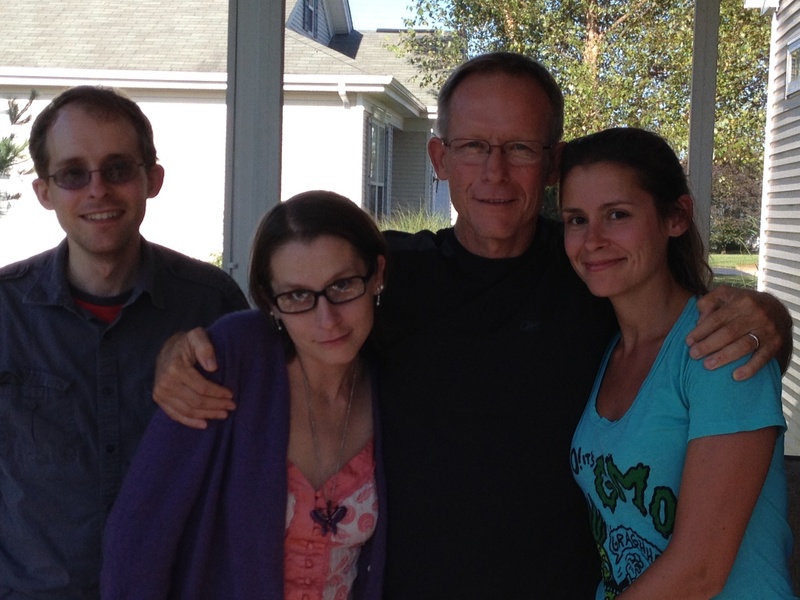 We loved having the gang together again for a couple of days . 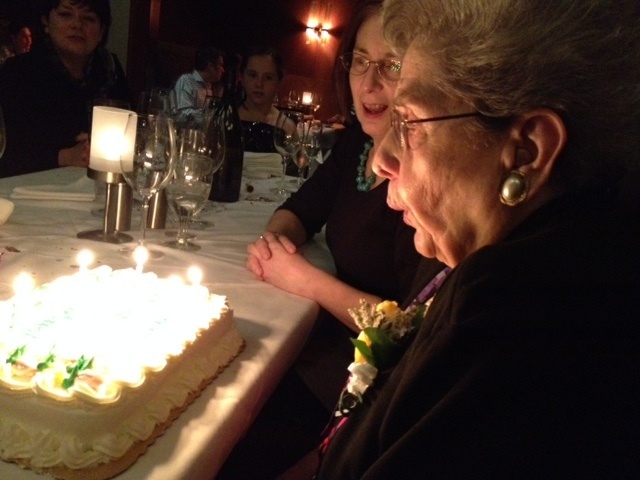 . .
Mama blowing out her candles with sister Frances behind her. 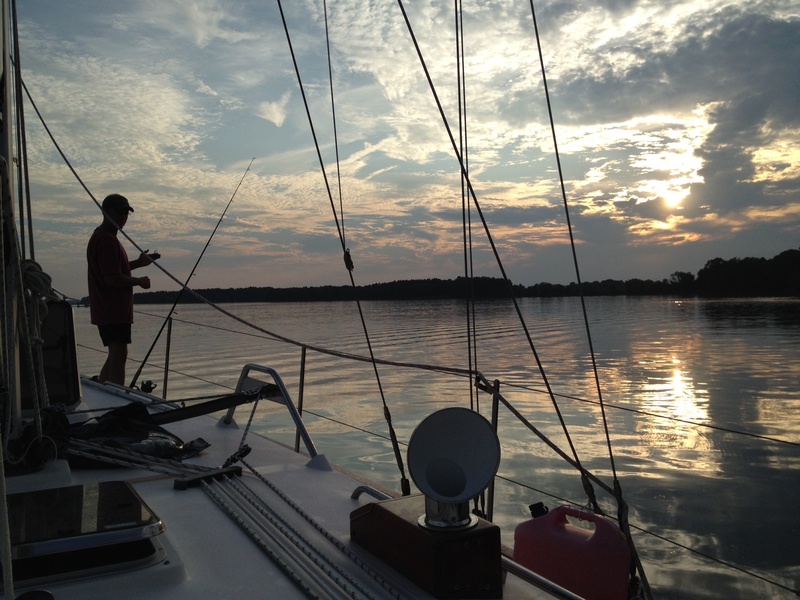 We took off from Annapolis this past Sunday morning early to start making our way south. 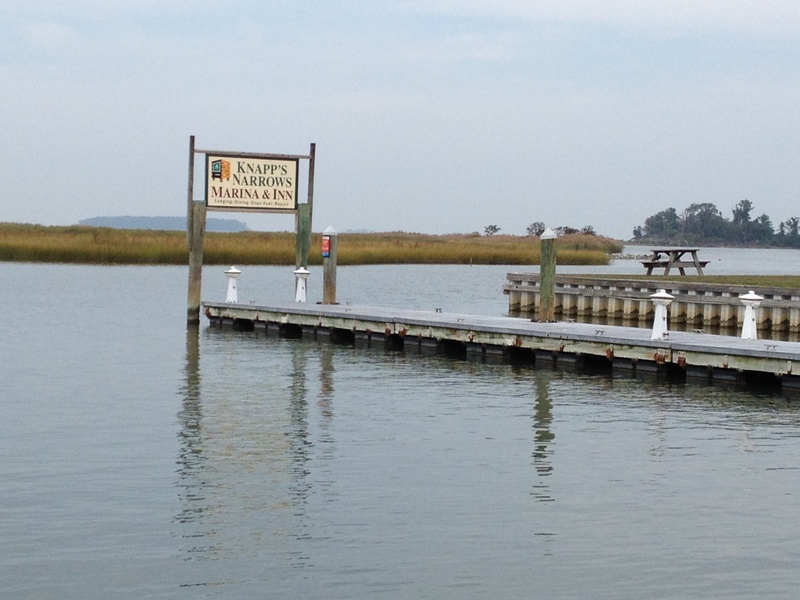 First stop, Solomon’s Island, MD for a quick overnighter. 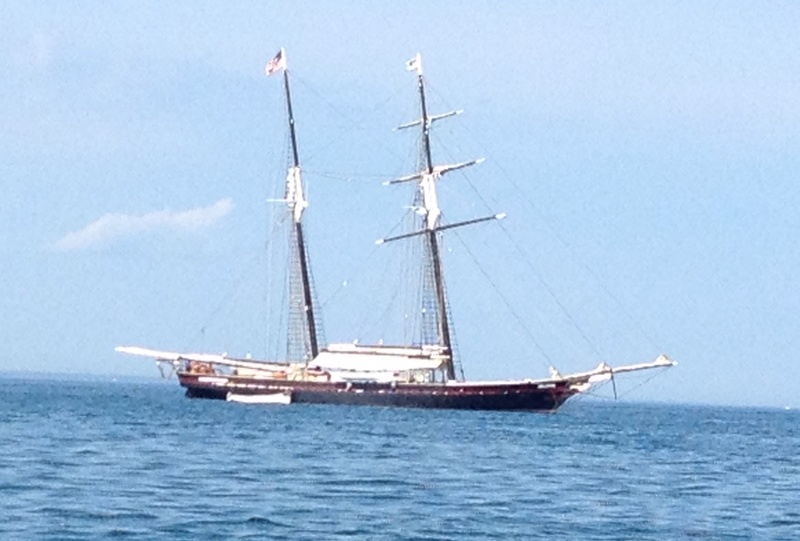 We ended up anchored by a boat that we met in Martha’s Vineyard this summer! After a quick chat with them as we rode the dinghy by, we agreed to meet up the following night in Deltaville, VA, the next night’s scheduled stop. We anchored up side by side in Fishing Creek and enjoyed cocktail hour in their very pretty and spacious cockpit. 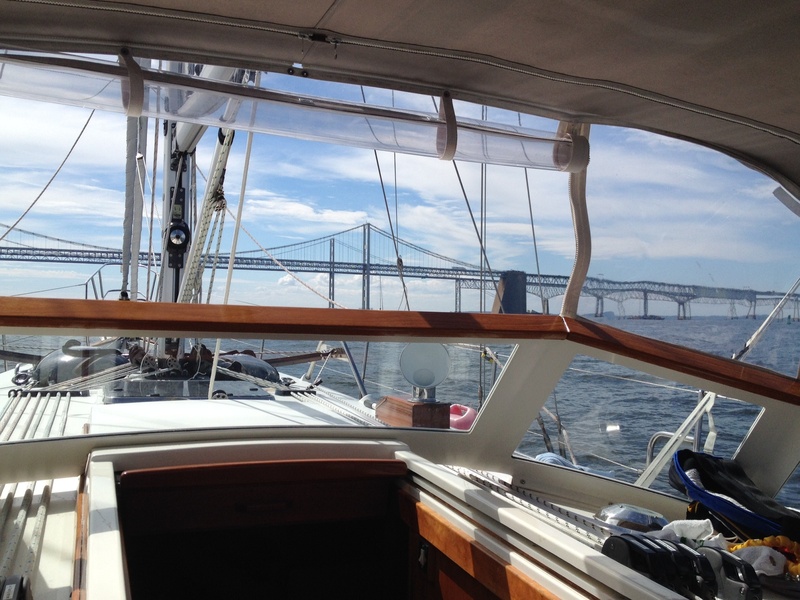 Leaving Annapolis . . . again. 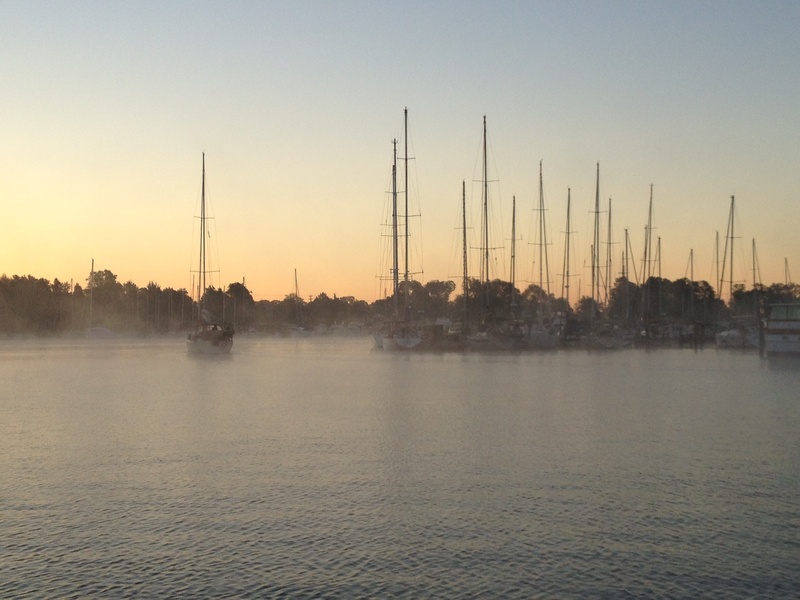 We left Solomon’s Island on a misty morning. 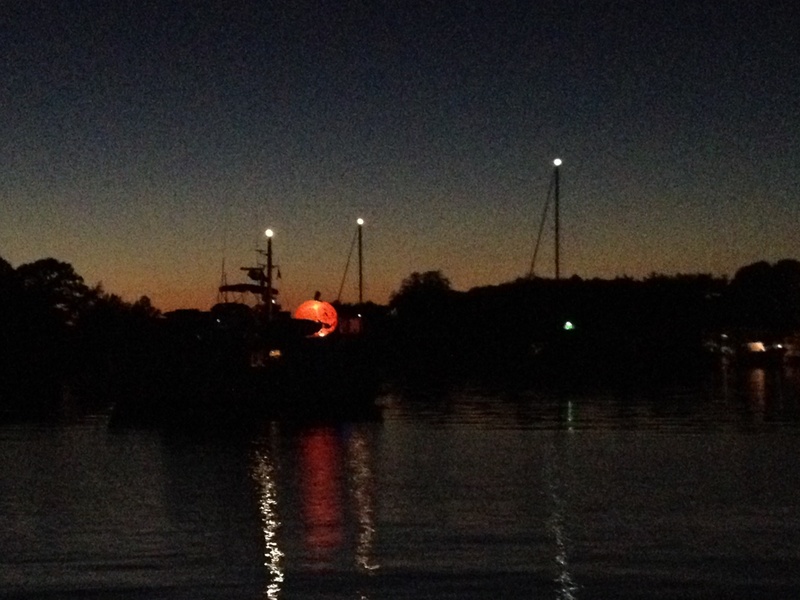 Gotta love this trawler who put up a GIANT inflatable pumkin on deck! What an easy way to find your boat at night! 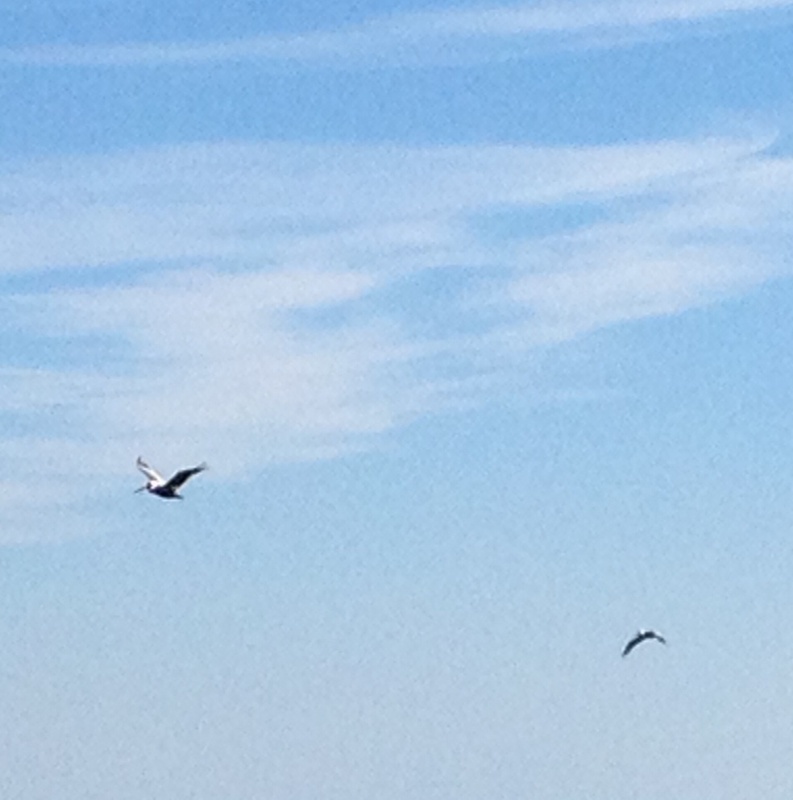 We spotted our first pelicans on the way to Deltaville! Feathered visitors as we sit in the cockpit of Pendragon. 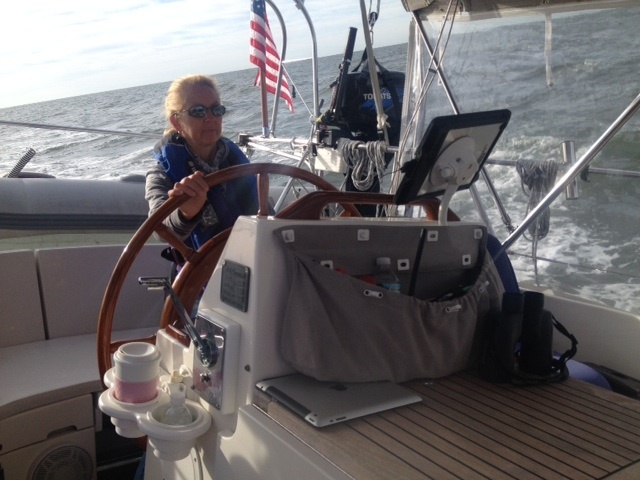 The minute we left Solomons and took a right on the bay, we were in new territory for Eleanor Q! 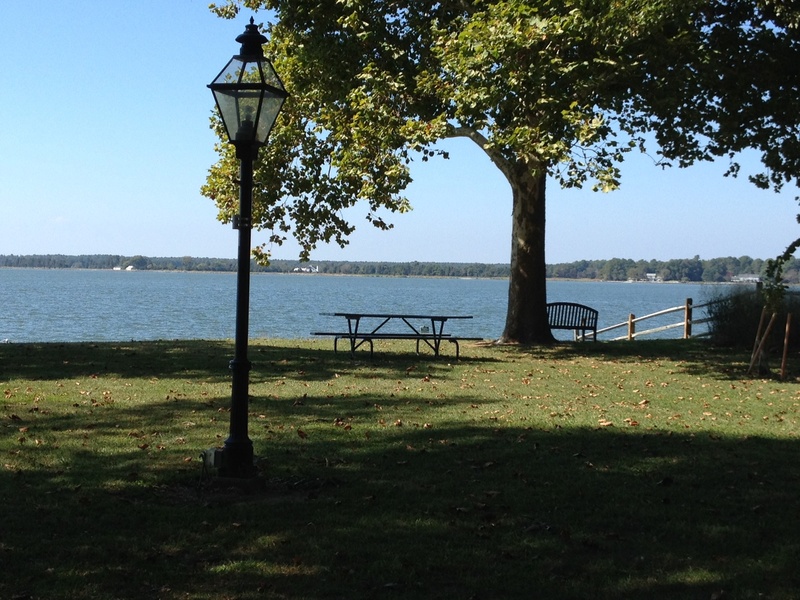 And so we begin the next leg of our trip – the southeast coast of the U.S. First stop, Hampton, Virginia. Hampton is “right close” to Norfolk, thus major military area. As we were getting close we noticed several helicopters and a couple of fighter jets hovering over the area, and we figured that might be normal for the area. 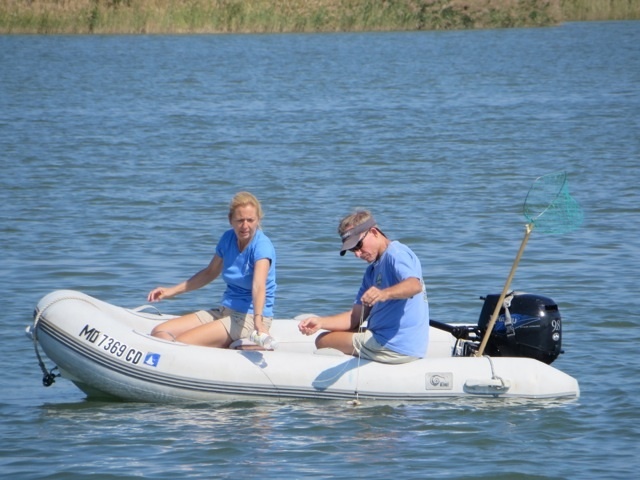 Then we heard a “securite” announcement (French pronunciation sounding like seh-cure-i-tay) commonly used on the VHF radio to alert boaters that a large vessel is underway. It announced that aircraft carrier # 71 was departing the area and going out to sea. It also reminded mariners that it is against the law to be any closer than 500 feet of a naval vessel, enforceable by force including deadly force. That certainly will make you think twice about doing a buzz by one of the navy fleet! 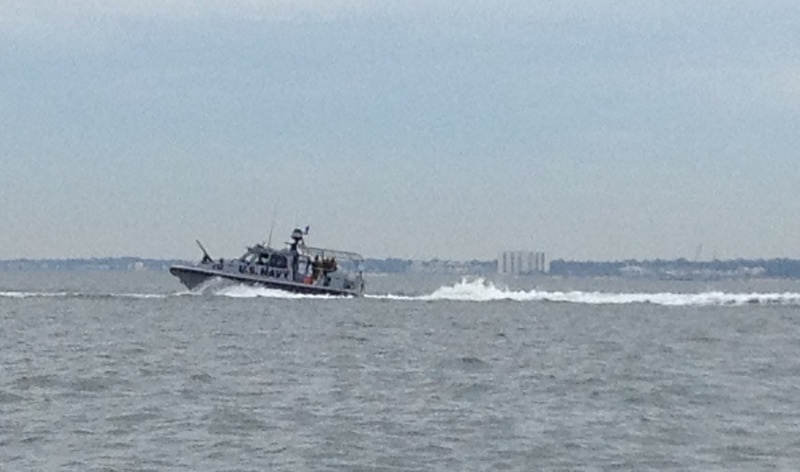 And sure enough, there was a Naval entourage leading the way with four heavily armed gunboats coming out first. 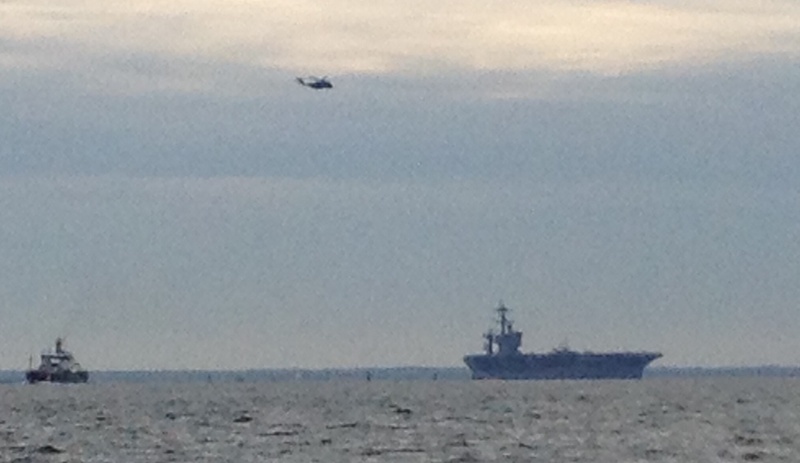 Then we watched as the USS Theodore Roosevelt come out of the Navy base. It was surrounded by a few skiffs directing it out. The ship had just undergone a complete overhaul in August, and after passing all of its sea trials had returned to Norfolk. Carrier #77 was parked right behind it, the USS Hebert Walker Bush. Both are nuclear powered ships. Frank looked up their specs. 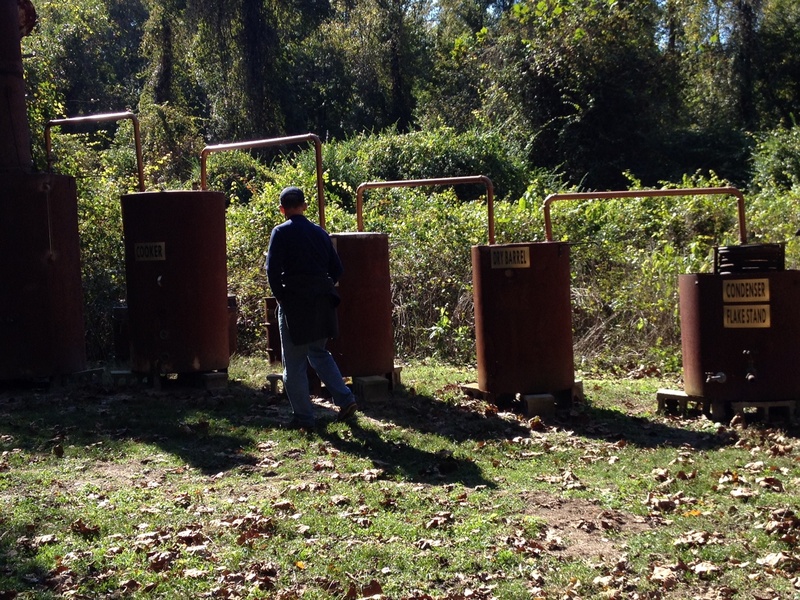 He quizzed me, “What do you think their range is?” This means how long can the boat stay out without need of refueling. The answer: 20 – 25 years. That ship wouldn’t have to come back into port for 20 – 25 years. I imagine that there would be a mutiny before they tested that theory, but that’s the deal. It is a self contained small city. Pretty amazing. When you look at the deck of the thing, you wonder what it is like for the young pilot the very first time they ever have to land on its deck. USS Theodore Roosevelt leaving port. And so, we’ve completed our first loop in the big adventure and are starting off on the next big piece: the southeast coast of the U.S. 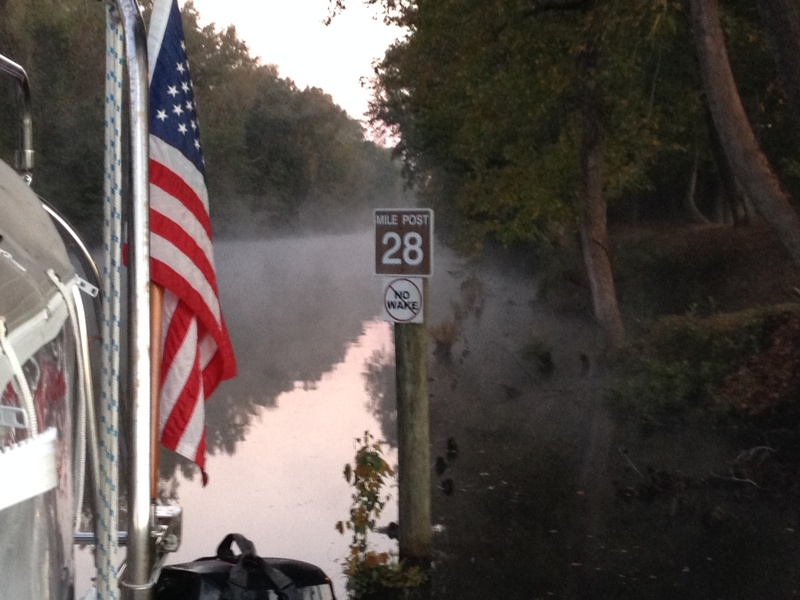 Tomorrow, we head for the Dismal Swamp. It’s not as bad as the name sounds . . . stay tuned!